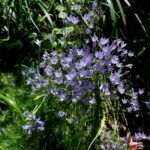 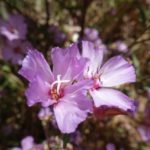 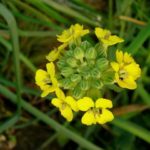 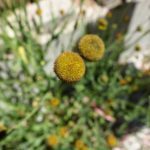 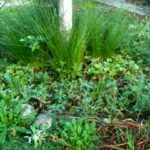 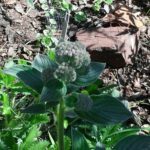 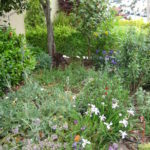 The CNPS Yerba Buena chapter's Spring Native Plant Garden Tour will not occur in 2017 due to time constraints. 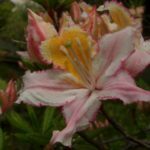 We plan to return in 2018 with this very popular event. 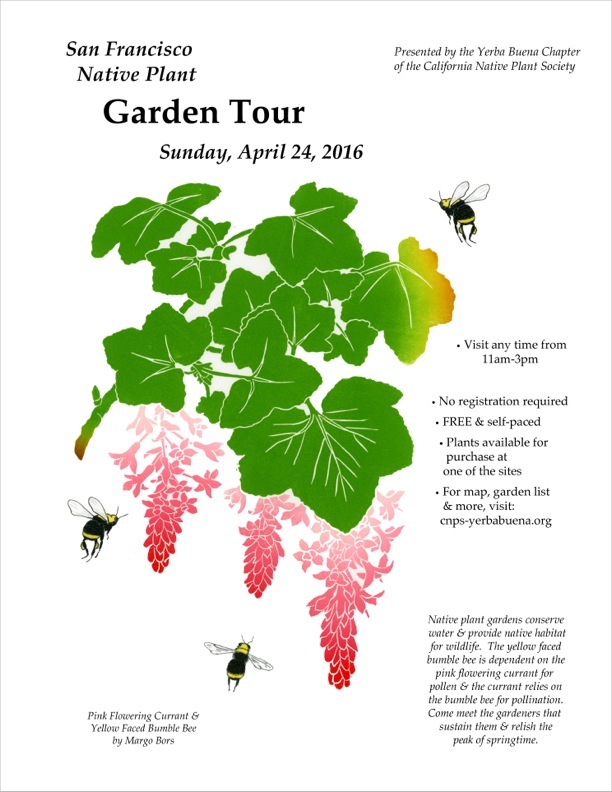 Here is the announcement from the April 24, 2016 tour that will give you a flavor of what's ahead. 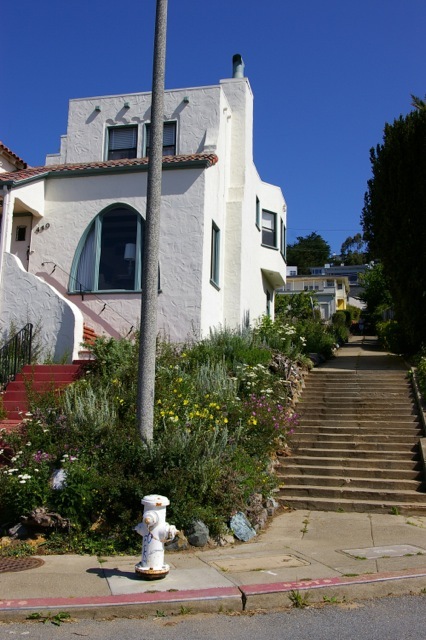 Ellen Edelson's 2207-26th Avenue (at Rivera St.), San Francisco, 94116. 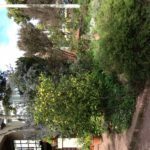 Easy Parking! 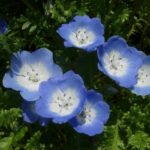 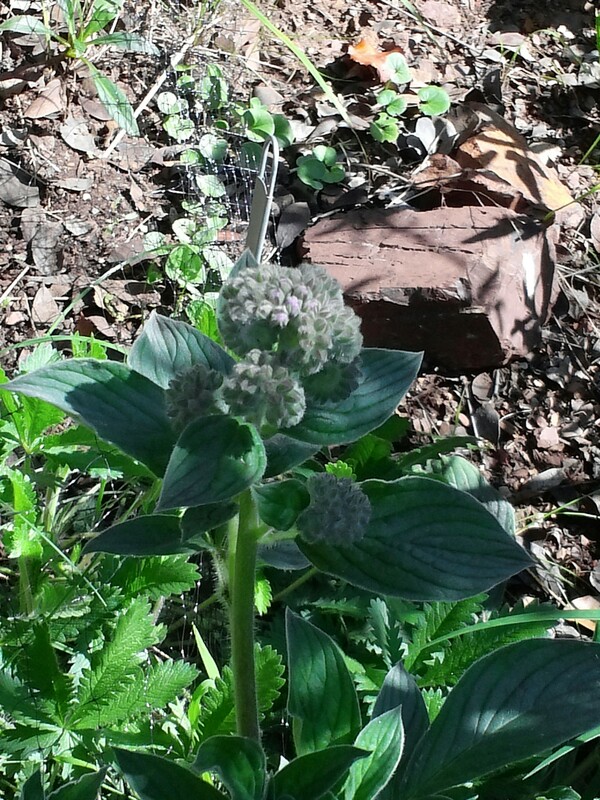 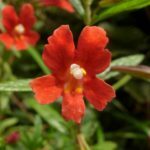 SPRING NATIVE PLANT SALE! 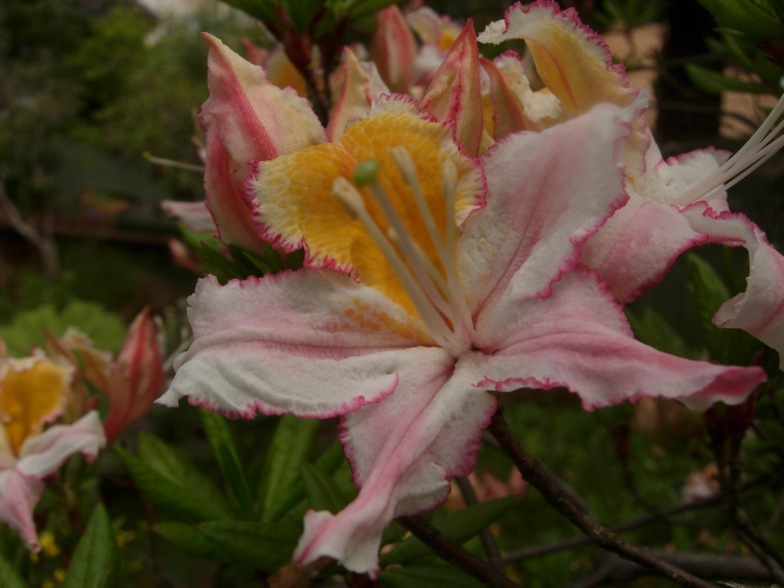 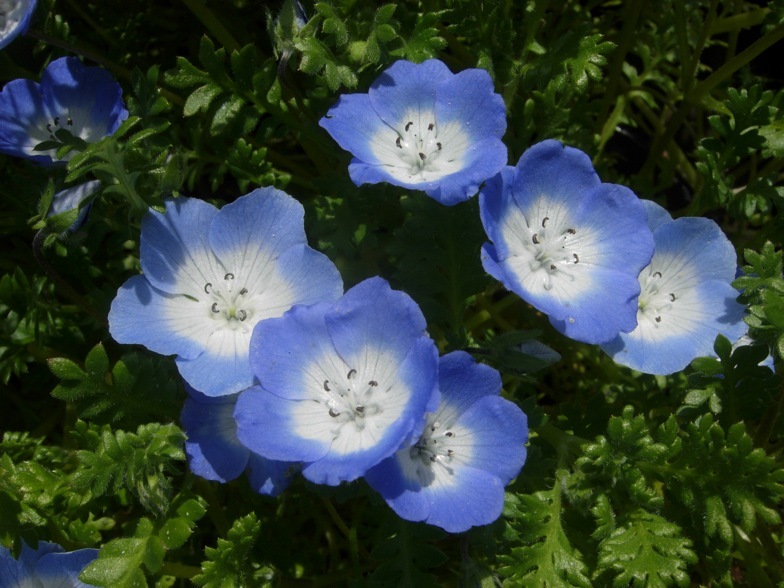 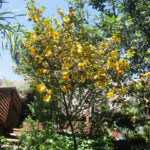 Sale of plants native to our chapter area: San Francisco and northern San Mateo Counties. 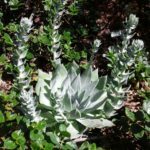 A very few plants are not locally native, but will not interbreed with our local flora, and are also good, useful garden plants. 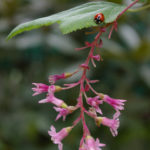 There will be well over 100 species available! 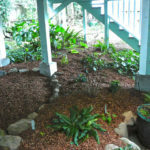 They include: trees, shrubs, vines, perennials, ferns, succulents, annuals, ground covers, herbs, bulbs, grasses. 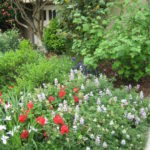 Many will be in bloom on Garden Tour day! 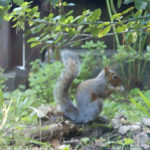 All have local wildlife value! 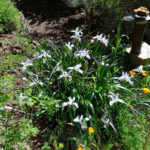 Photos, reference books, and personal assistance will be available to help you choose the right plants for your garden. 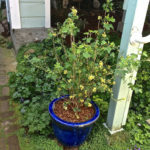 Sizes range from 2" to 5 gallon; most are 1 gallon or 4" pots. 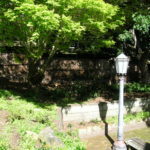 Cash, check or credit card accepted. 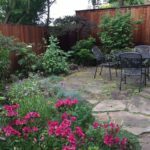 Discount for CNPS members! 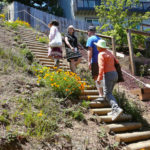 (Memberships available onsite!) 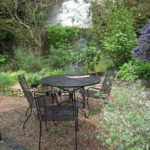 Open on Garden Tour Day-- from 11am to 6pm! 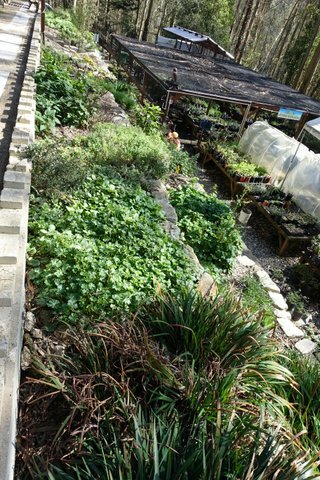 Mount Sutro Native Plant Nursery maintains a large demonstration garden showcasing local native plants, and providing habitat for pollinators. 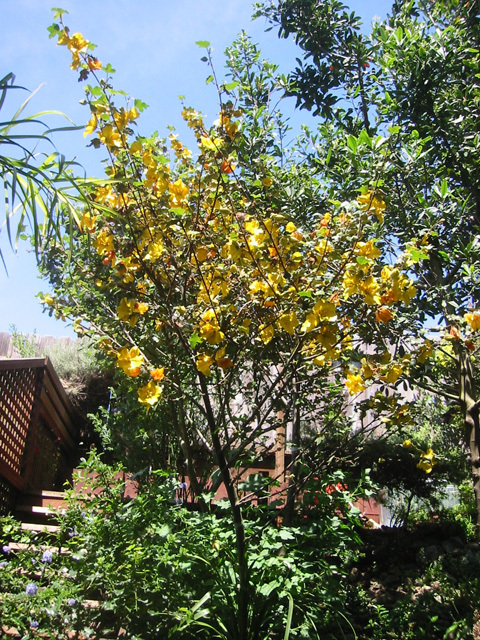 Enjoy our terrace garden in the nursery, or visit our hillside garden and see many local native plants in bloom. 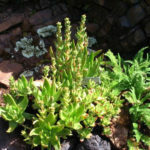 We will also have plants available for sale. 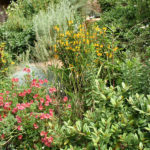 Many species of locally native and drought tolerant plants available for purchase. 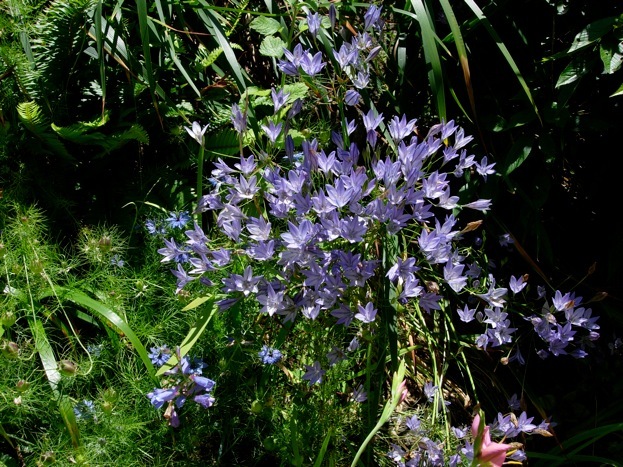 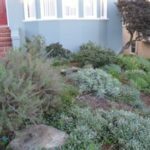 Our selection of native plants is perfectly suited for San Francisco's unique soils and micro-climates. 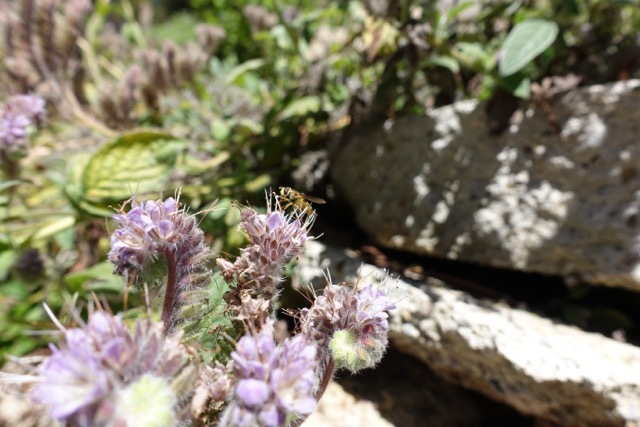 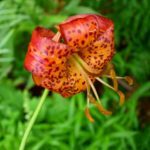 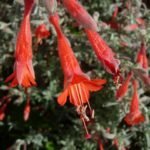 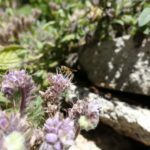 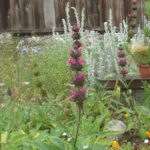 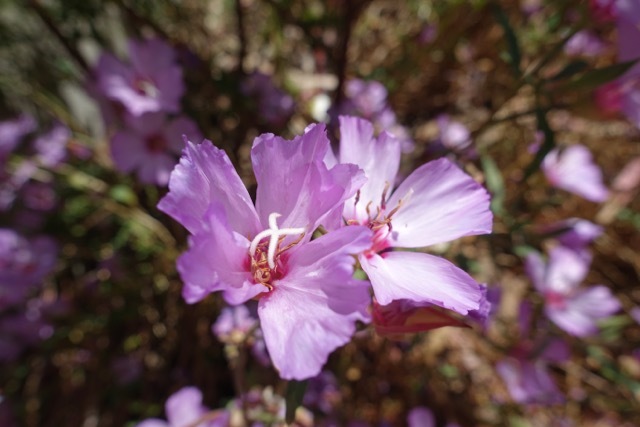 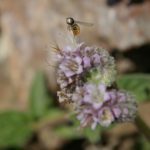 California native plants are a great addition to any garden or landscape and provide food and home for native insects such as bees and butterflies. 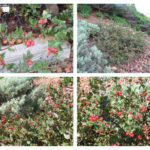 More information on plant availability at Sutro Stewards Nursery. 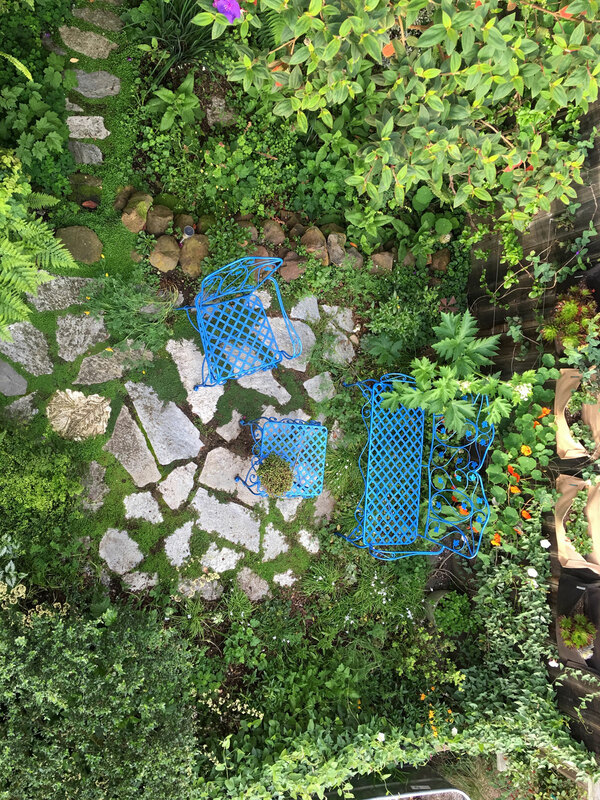 Parking available above the nursery. 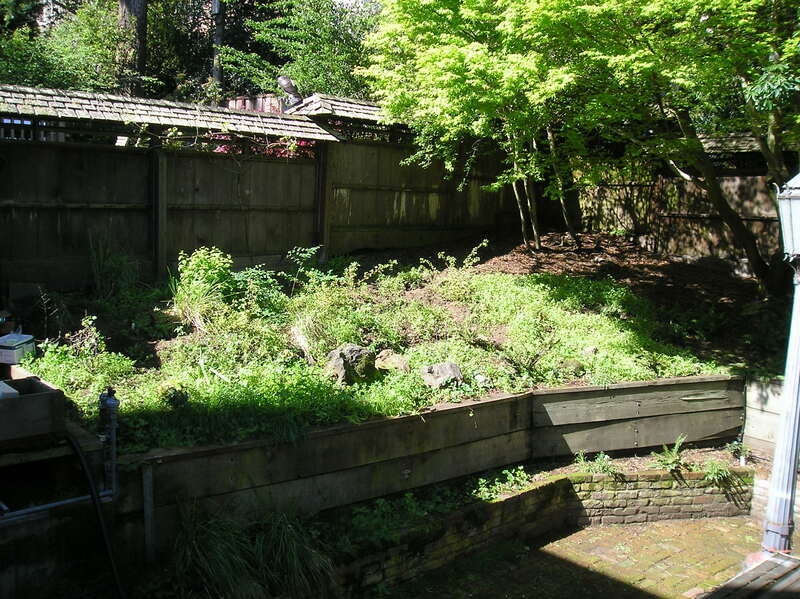 This backyard rehab project has been a constant battle against weeds. 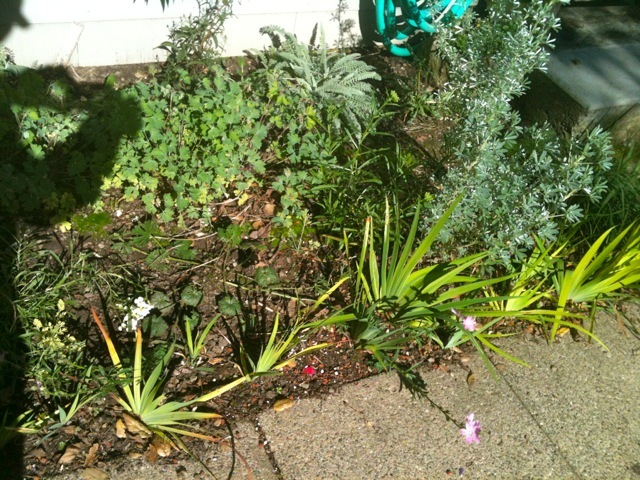 Cardboard sheet-mulching has been the weapon of choice. 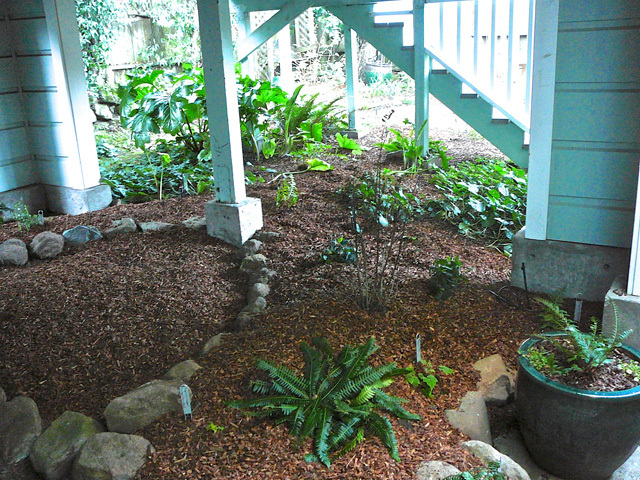 A limited budget necessitated a lot of Craigslist searches to find free wood chip mulch. 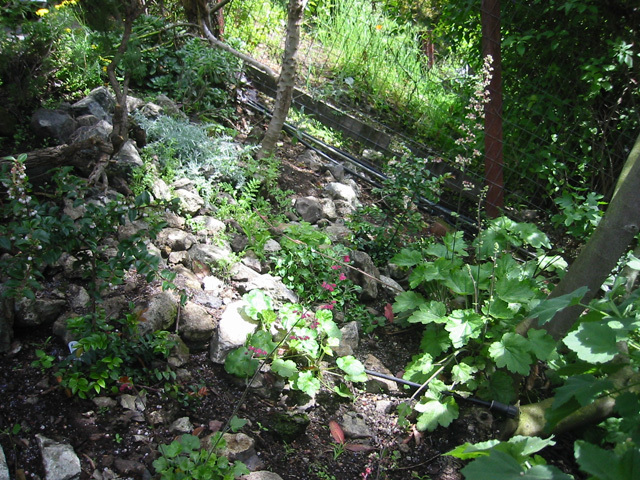 Many plants in the garden were grown from seed on site. 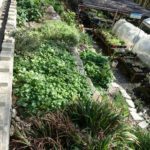 Others came from 10 different native nurseries. 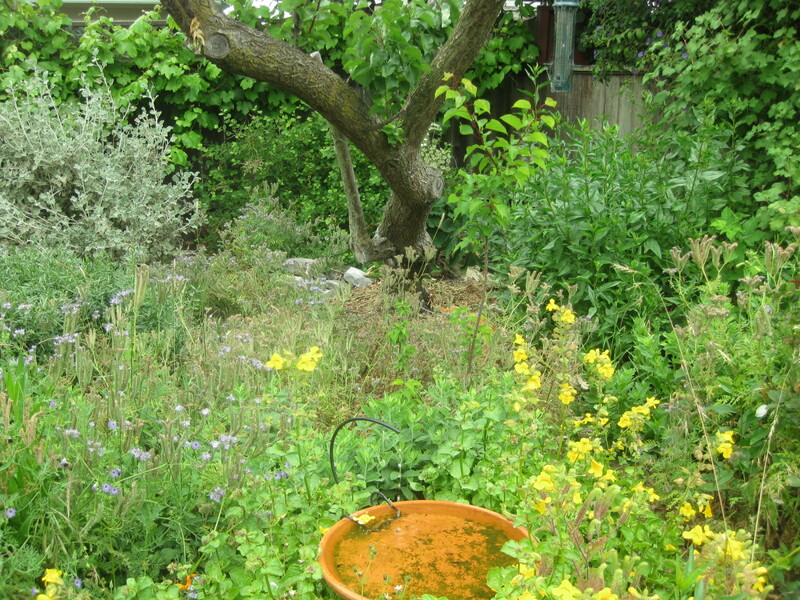 All the work has resulted in a haven for bees, butterflies and humans. 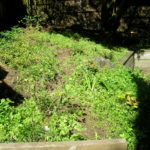 But the battle against weeds marches on. 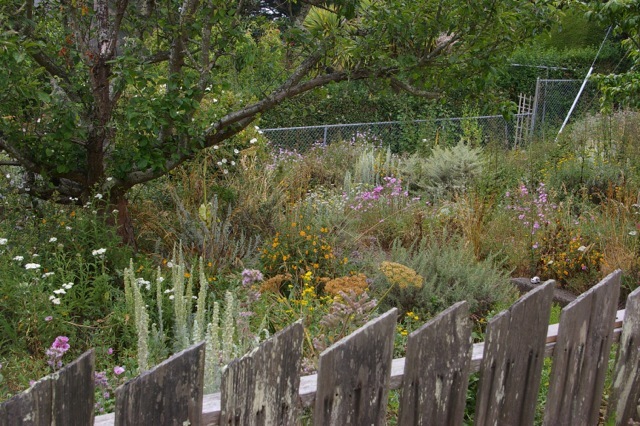 The original garden was composed of mostly predictable non-native species. 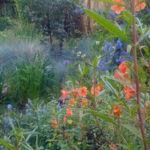 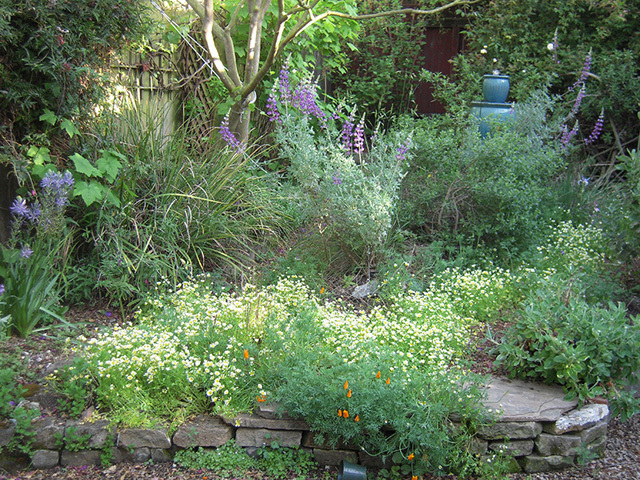 However, about six years ago, due to excessive water consumption, we started the transition to native plants. 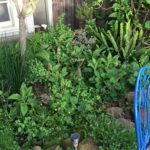 Now the rear shade garden is a mostly native garden with ribes, heuchera, iris, cows parsnip, bush mimulus and california pipe vine. 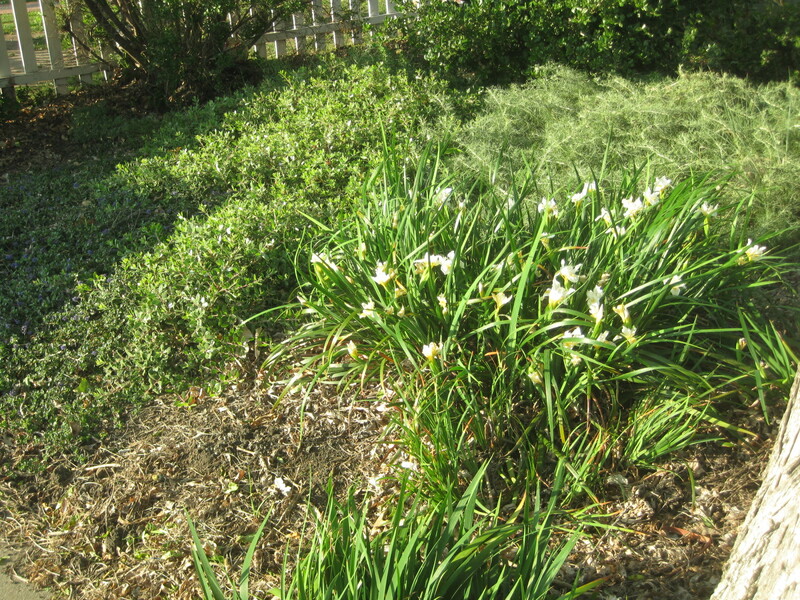 The few non-native hold-overs are watered with reclaimed laundry water. 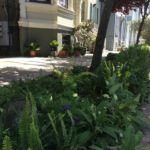 In the front, on the 500 block, there are a series of sidewalk gardens with native poppies, penstemon, ceanothus and various drought tolerant plants. 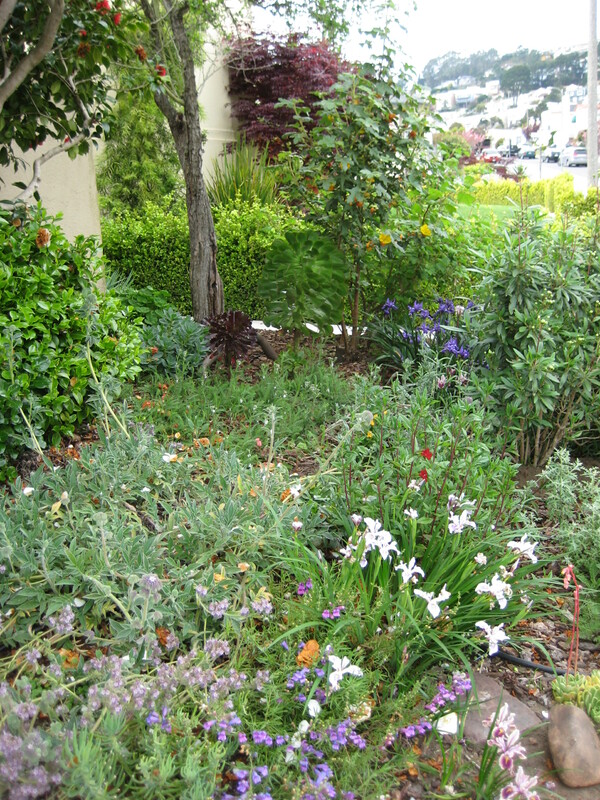 This part shade and part sun garden features a variety of plants native to the Bay Area and Northern California. 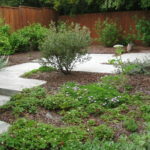 One enters the shaded area with an abundance of ferns, currants and other shade loving plants along with riparian plants and a small pond and dry creek bed. 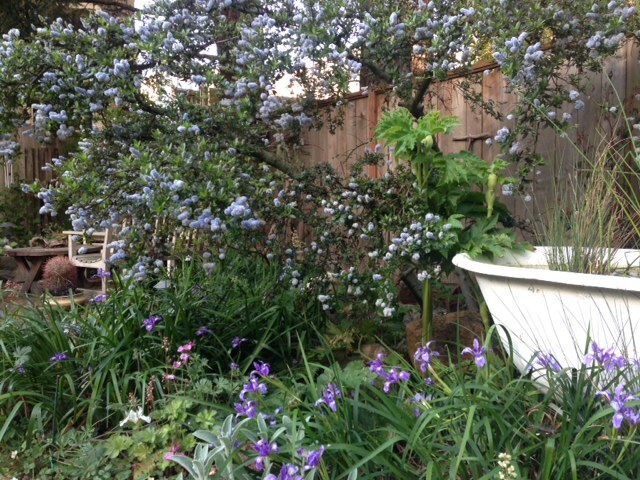 Crossing a small bridge is a sunlit meadow with grasses, mature manzanitas, ceanothus and spring wildflowers. 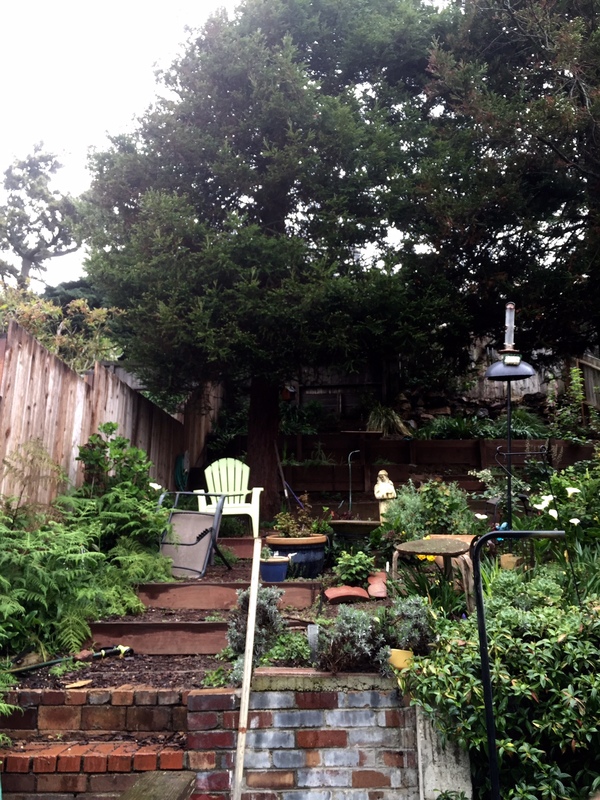 The back area has a seating area shaded by redwoods. 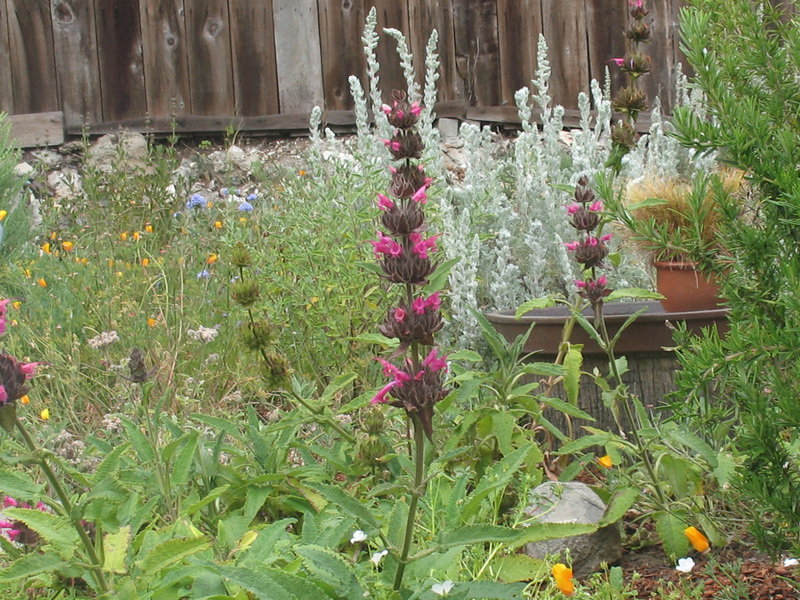 This garden features a small but thriving population of native pacific chorus frogs. 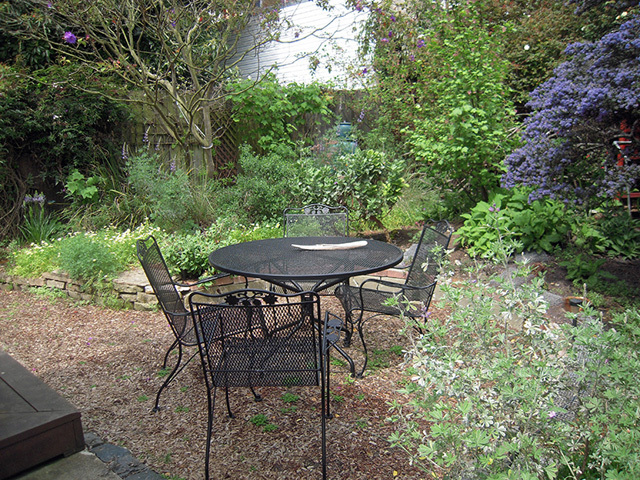 The owner is a retired gardener who plants for butterflies and insects which attract birds. 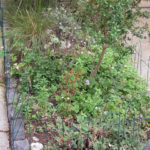 Ribes, manzanita, ceanothus, fescue, buckwheat and others surround a patio behind a (look for it) PURPLE building above Dolores Park. 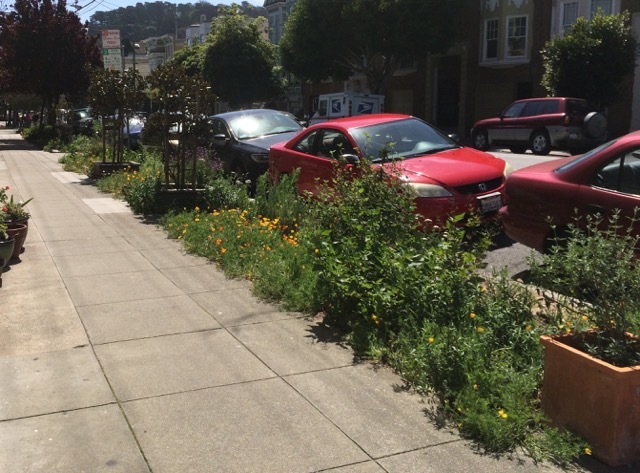 Parking is difficult on weekends, but be brave. 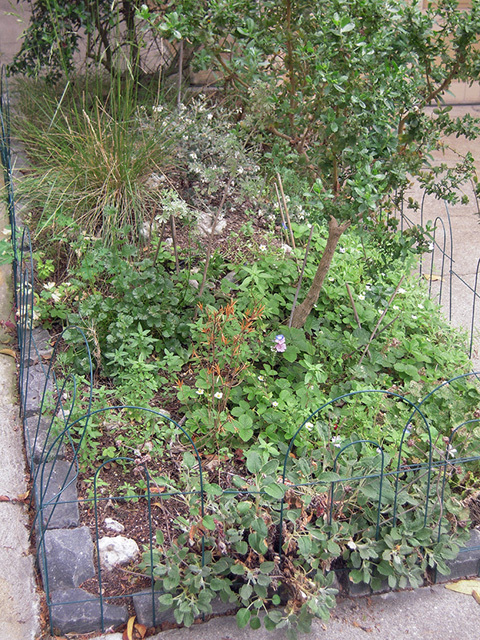 This is a sidewalk garden with a focus on local native plants. 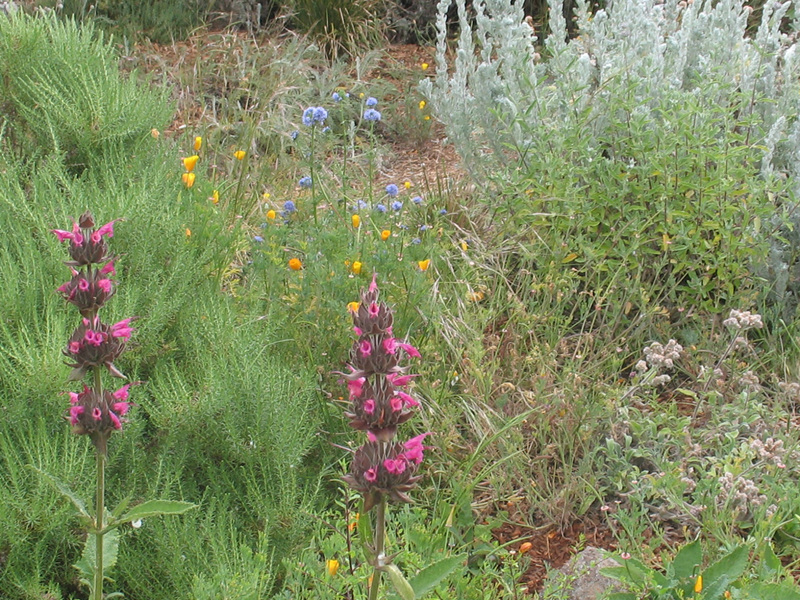 Sticky Monkey flowers bookend a collection of Sidalcea, Iris and Arctostaphylos along with hybrid Penstemon, non-native grasses and ferns. 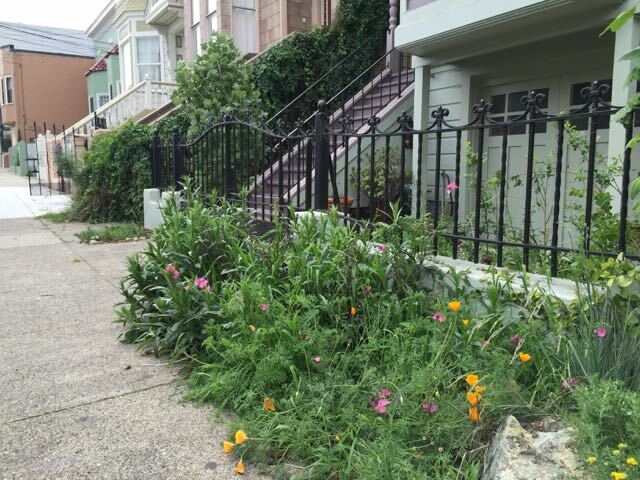 Our sidewalk garden, created in 2013, is populated entirely with California natives, nearly all of which are indigenous to the Bay Area. 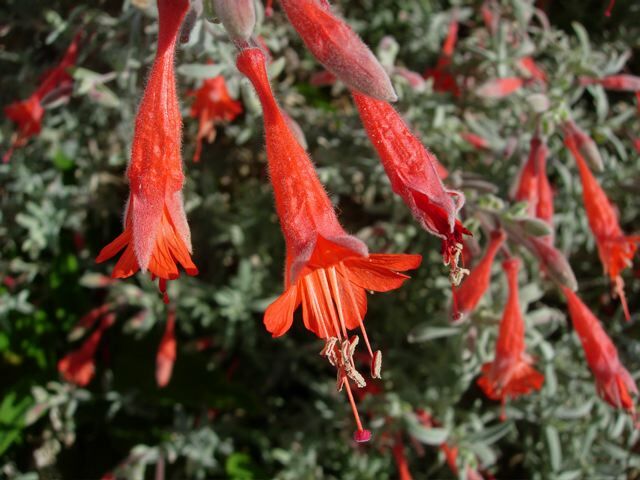 For an added challenge we’ve selected plants with blooms matching our house colors. 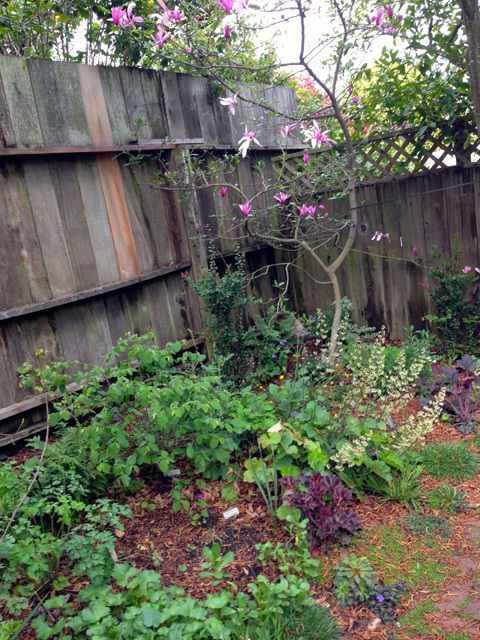 Our small, shaded backyard garden was mostly brick & concrete taken over by bamboo 5 years ago. 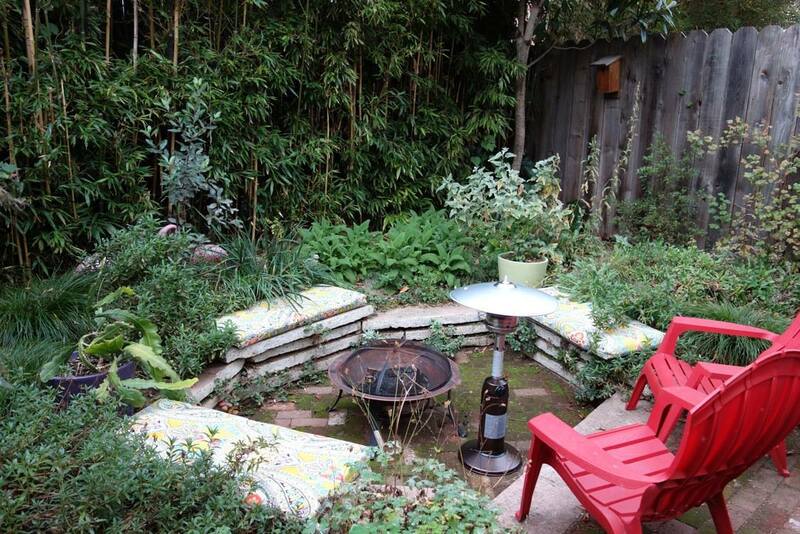 We contained the bamboo with a barrier, sawed the concrete, and stacked the pieces into benches circling a fire pit. 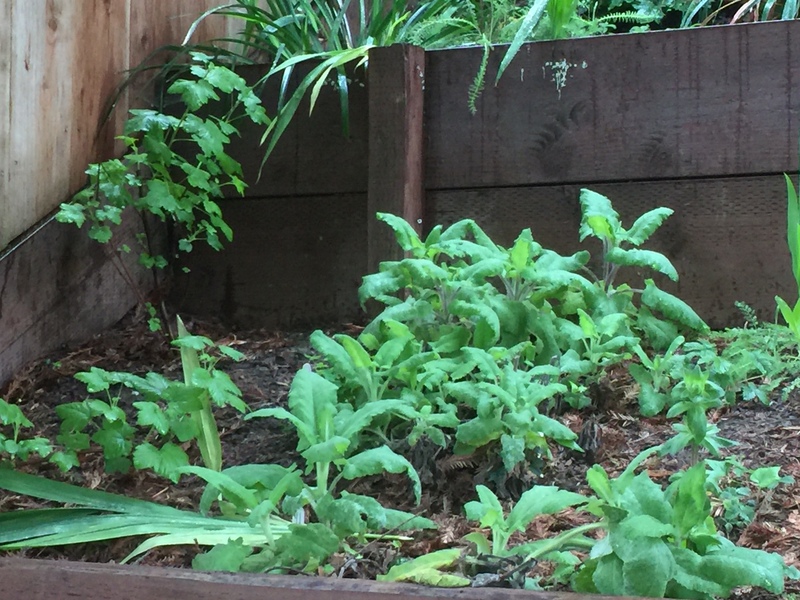 We filled the rest with California natives emphasizing scents: hummingbird sage, yerba buena mint, coyote mint, and a few other aromatic species. 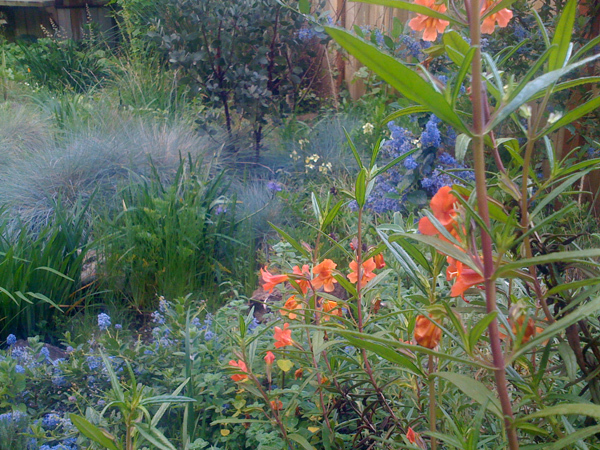 Columbine, evening primrose, and monkey flower also seem to like the conditions. 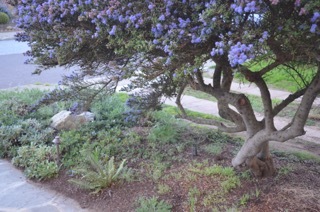 We also have a "client" living here: franciscan manzanita. 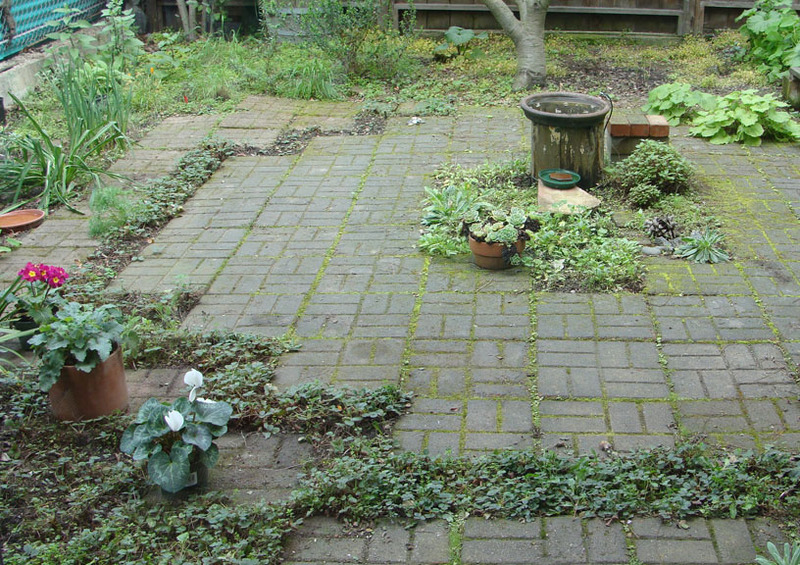 Unfortunately our attempt to have the yard protected as critical habitat for this species was denied. 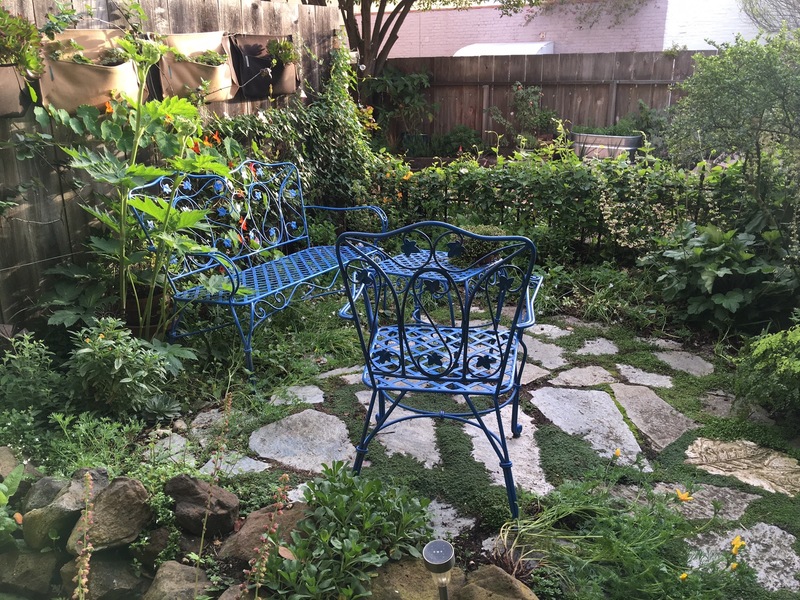 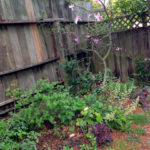 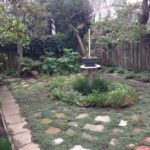 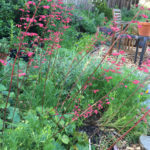 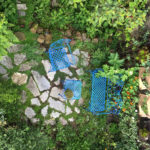 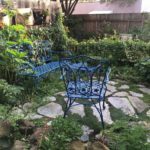 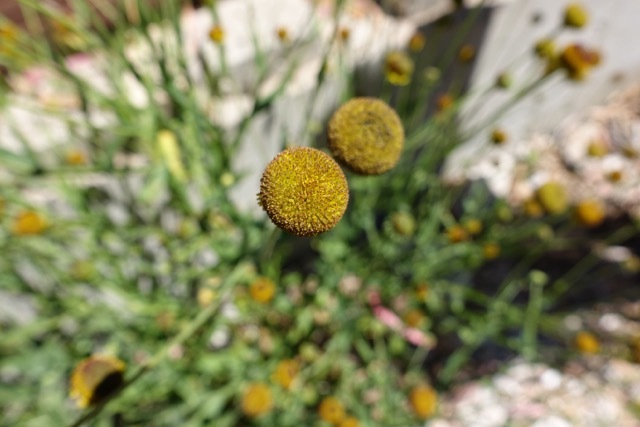 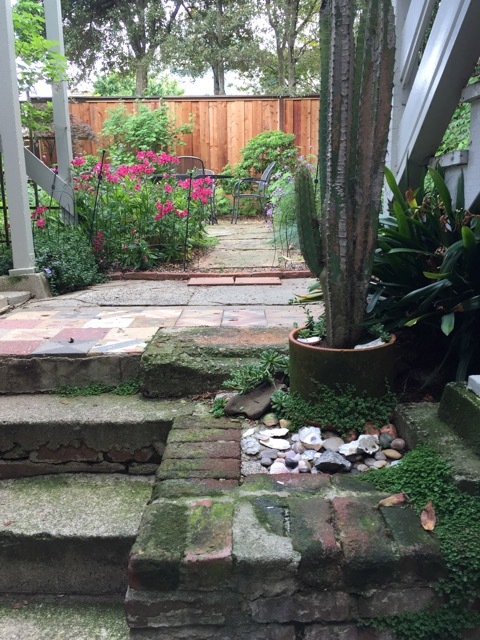 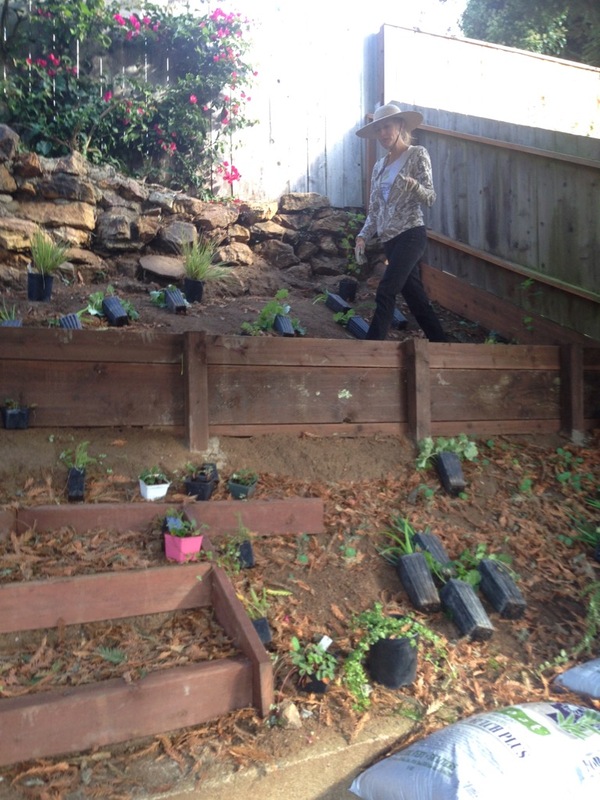 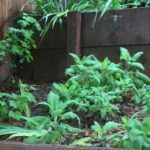 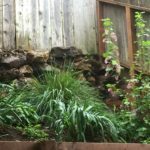 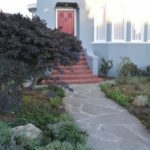 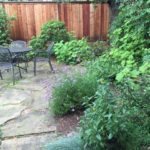 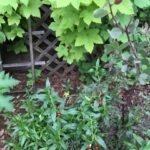 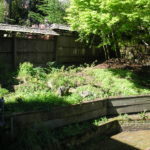 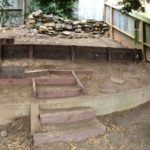 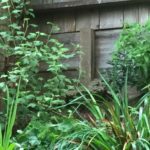 Our backyard garden was designed and installed by San Francisco Landscapes, maintained with the help of Amber Hasselbring and Ellen Edelson, but all the subsequent failures were our own. 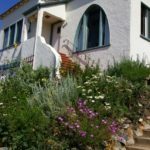 Alan Hopkins painted a mural of Drake’s Beach, where we were married, and populated it with some non-fora "clients," creating another identification challenge for our guests. 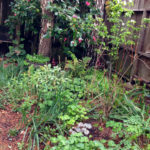 This is a largely shade garden with ferns, trillium, and other shade plants. 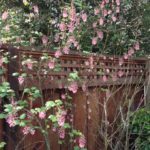 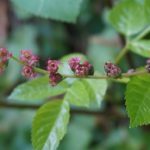 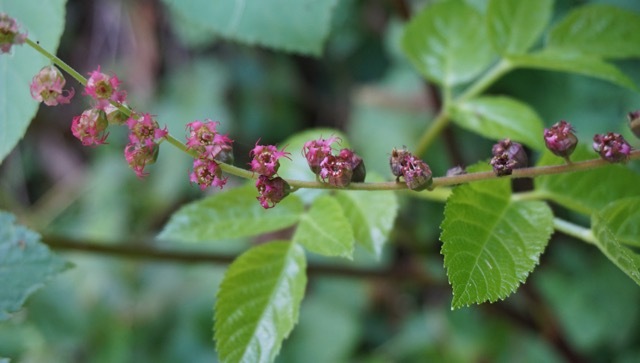 It also has a coast live oak, pink flowering currant and more than 30 native plants that insure a steady stream of birds, bees, and other beneficial insect visitors. 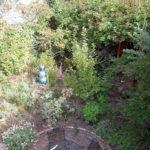 The plants and various creatures are enjoyed and sometimes drawn or photographed by artist Margo Bors from her studio that looks out on the garden. 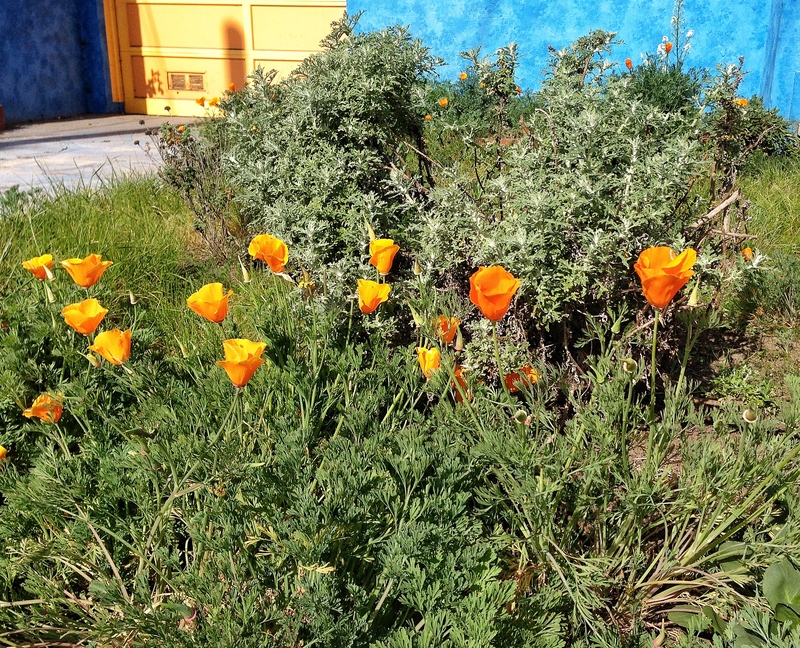 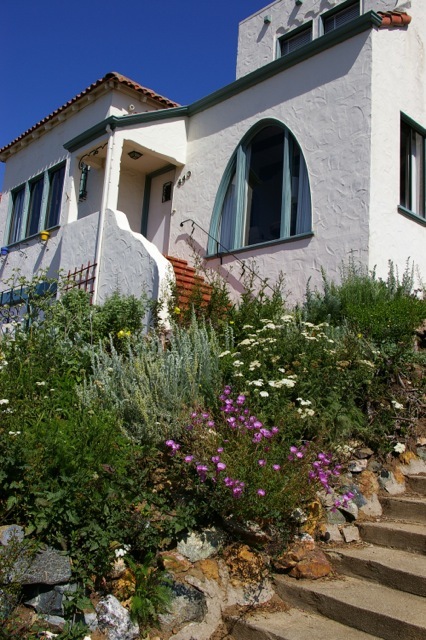 Our garden is located on a sunny slope of the South side of Potrero Hill. 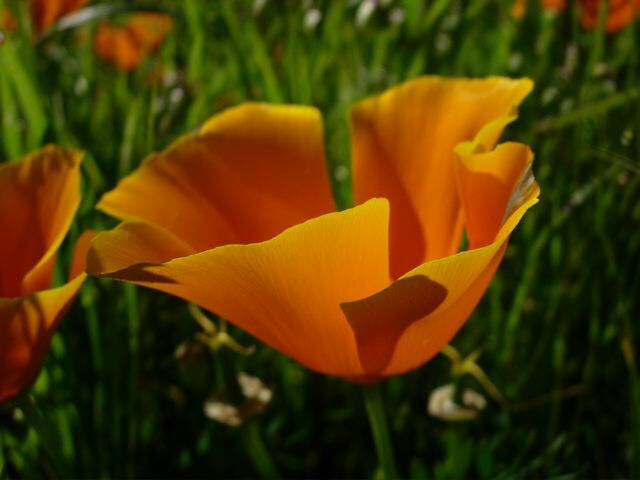 It contains, many California natives that are attractive to bees and birds. 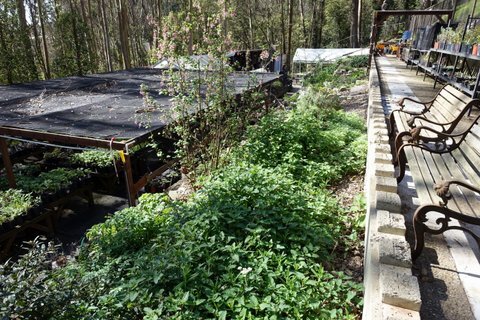 It is thriving with a variety of plants that provide us with a lovely view of small forest on the North side of our home. 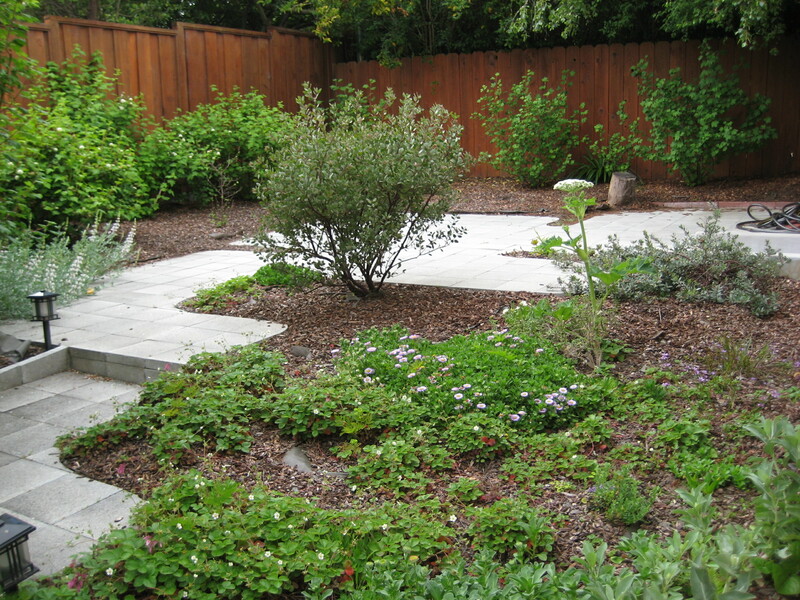 The garden consists of native perennial shrubs and trees with an understory of ground cover. 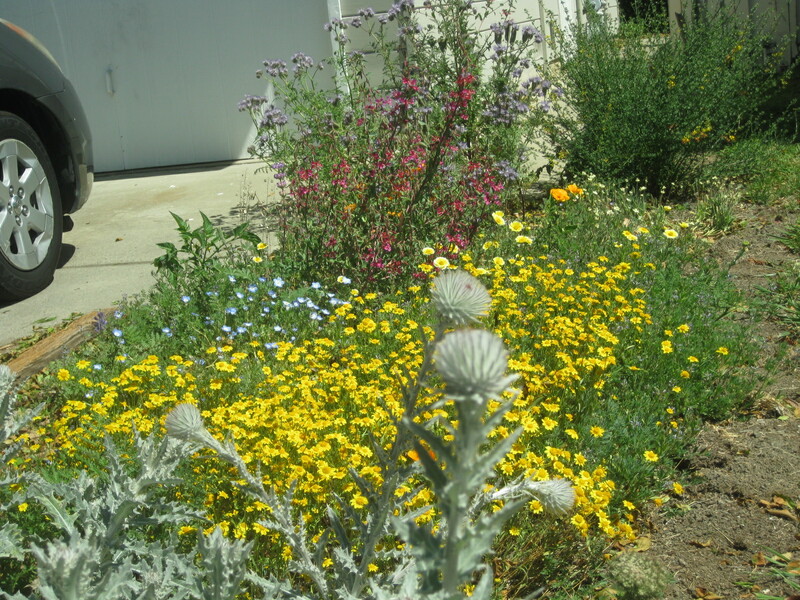 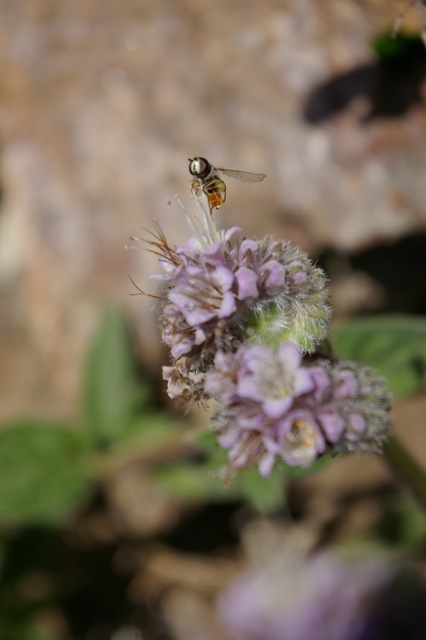 In the spring we sow California wildflowers and many native bees visit them. 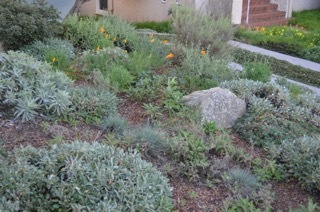 Newly replanted native garden after the drought decimated the old one. 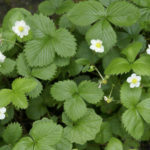 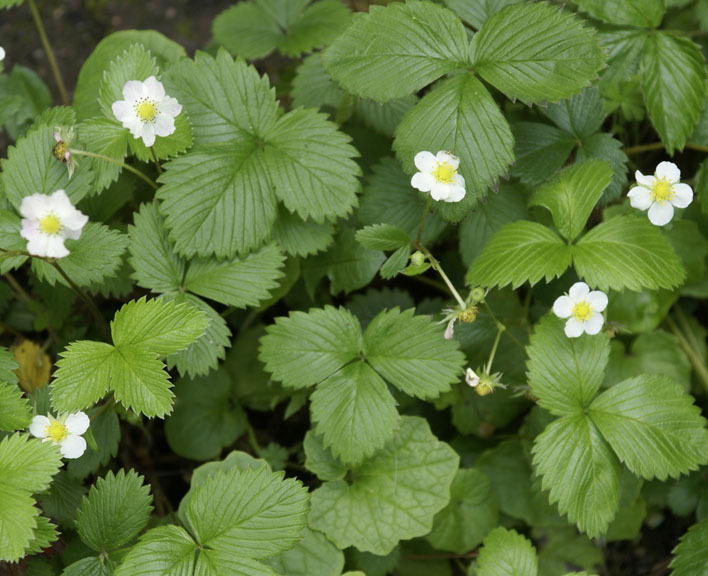 Planting include: Reed grass, Wood fern, Woodland strawberry, Alum root, sword fern, coffeeberry, golden currant, gooseberry, snowberry and a mix of shade tolerant annual wildflowers. 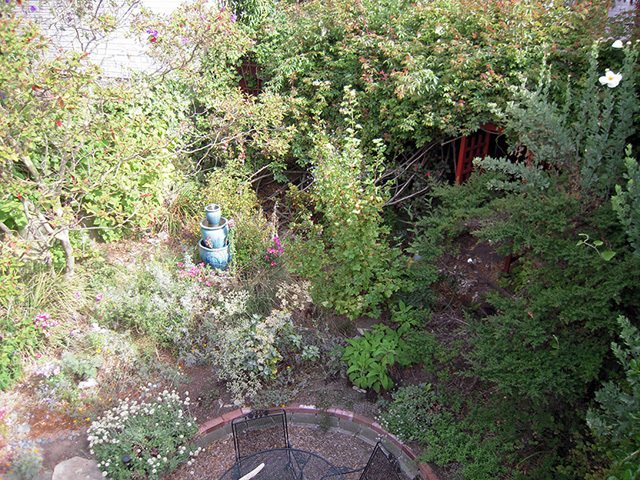 A rain barrel system has been installed to mitigate future dry spells. 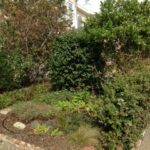 From disastrous, major plant deaths came an opportunity for this north-facing, shady garden to grow a new look. 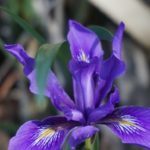 The owner filled newly empty flower beds with cheerful natives such as Douglas iris, fringe cups, monkey flower and heuchera. 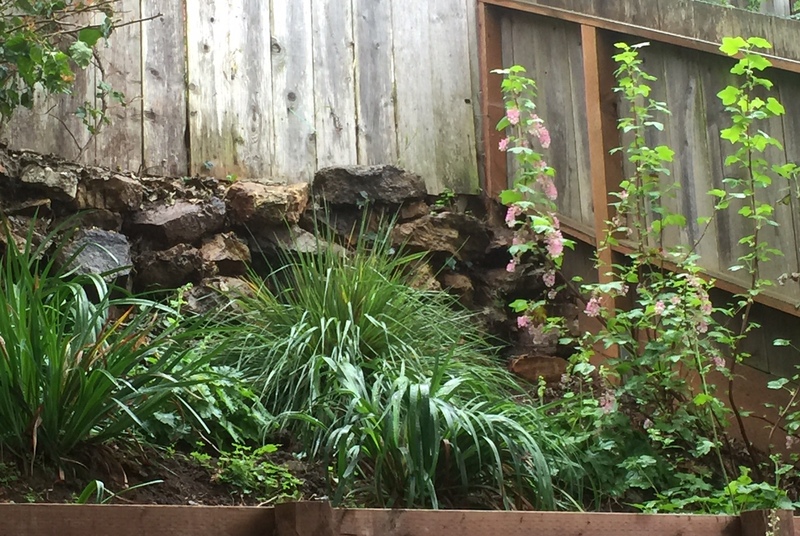 In a deep shade area under the deck she created a native plant garden with wild ginger, redwood sorrel, and bleeding hearts wandering here and there among ferns. 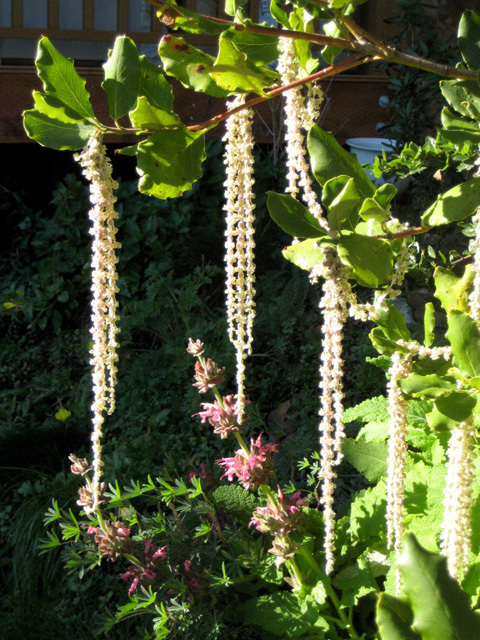 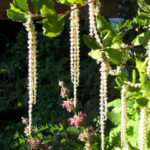 Surviving from earlier years, mature birch trees tower over newer plantings of western azalea, cream bush, hazelnut and a young silk tassel tree. 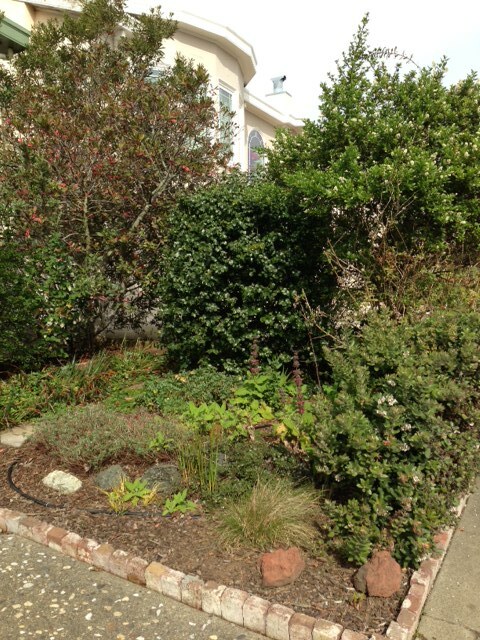 This five-year-old garden continues to go through delightful transformations as additional natives are tucked in. 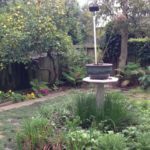 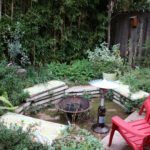 The small backyard garden has been transformed for over ten years from a conventional garden with lawn to mostly California and San Francisco native plants. 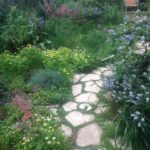 Design goals include attracting pollinators, wildlife viewing, use of existing materials, and creating a self-sufficient garden. 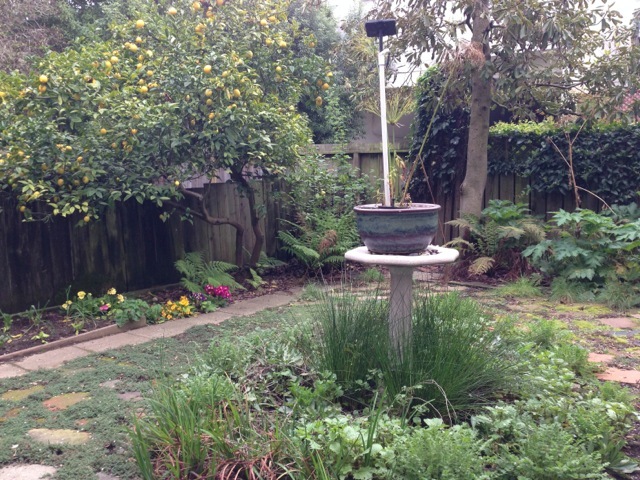 The sprinkler system was converted to drip and a homemade fountain was added. 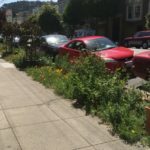 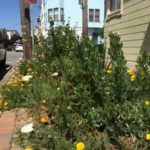 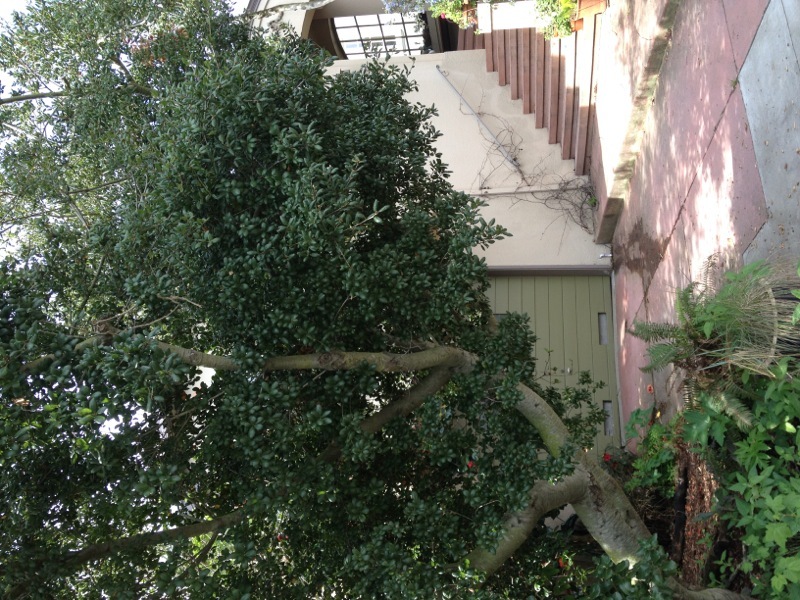 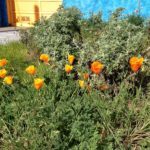 Most recently, sidewalk was replaced with landscaping planted exclusively with natives local to the neighborhood based on Glen Canyon Park species list. 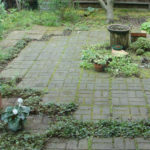 A lattice was also added to the back deck for California wild grape and honeysuckle. 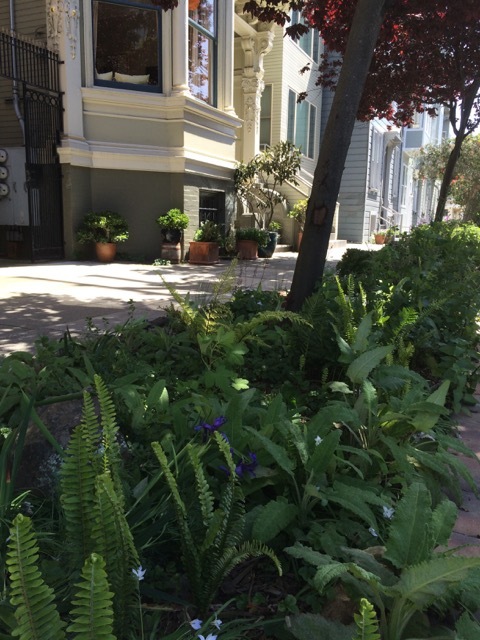 Previously, a concrete parking island in front was removed and the area planted only with SF natives. 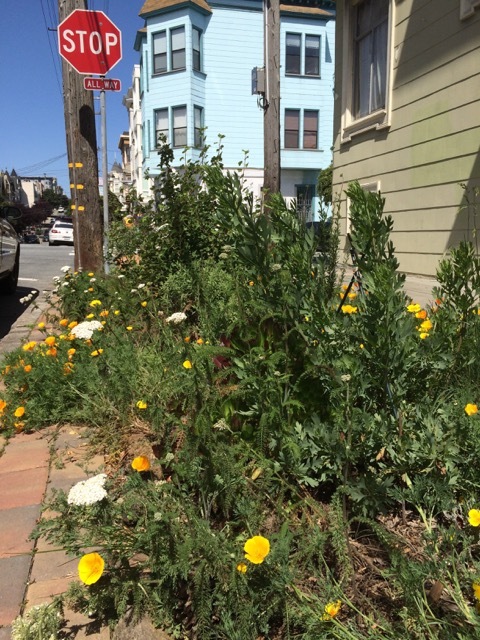 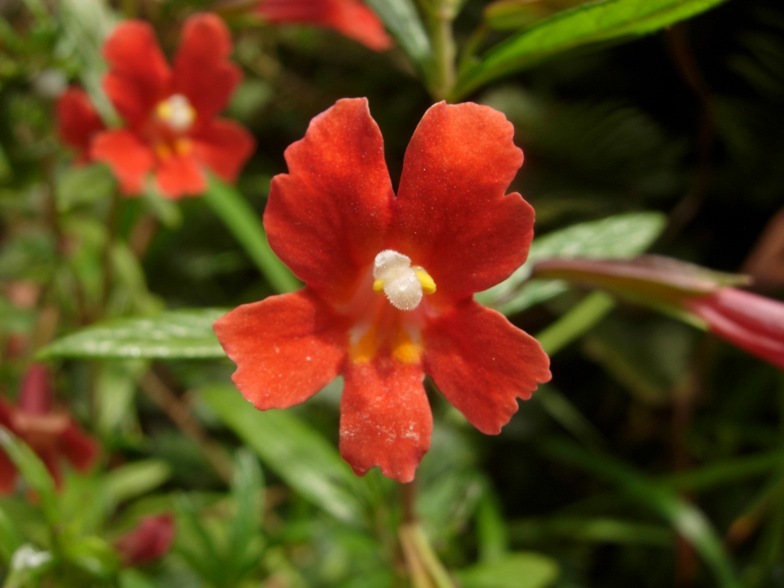 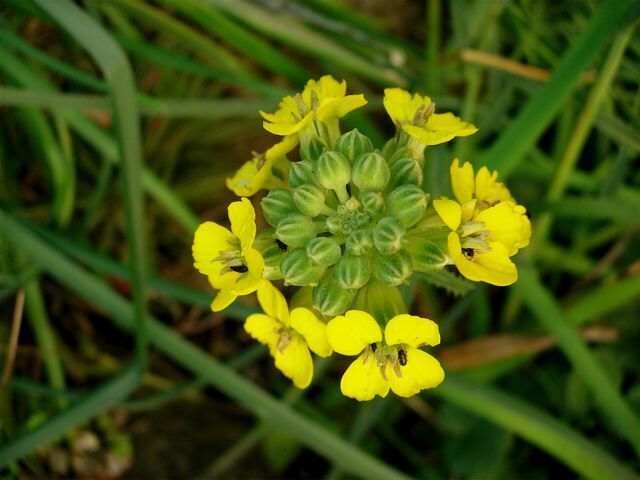 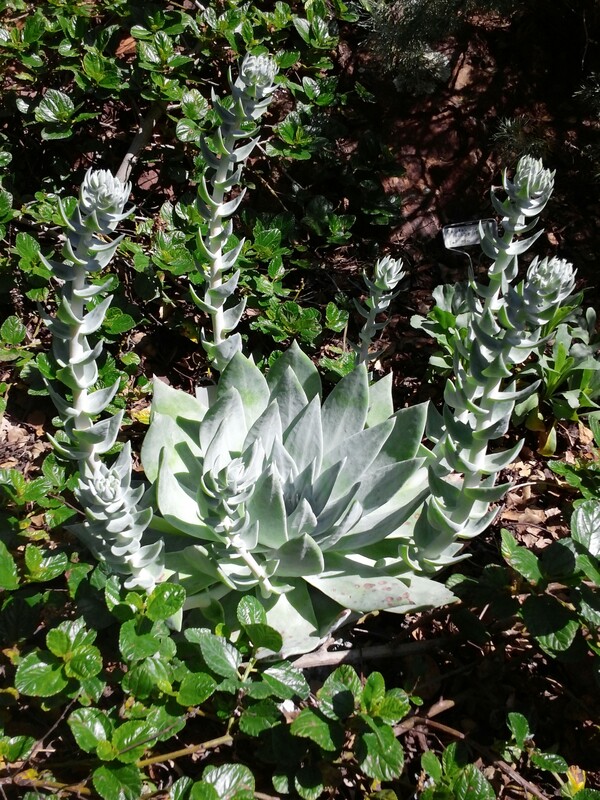 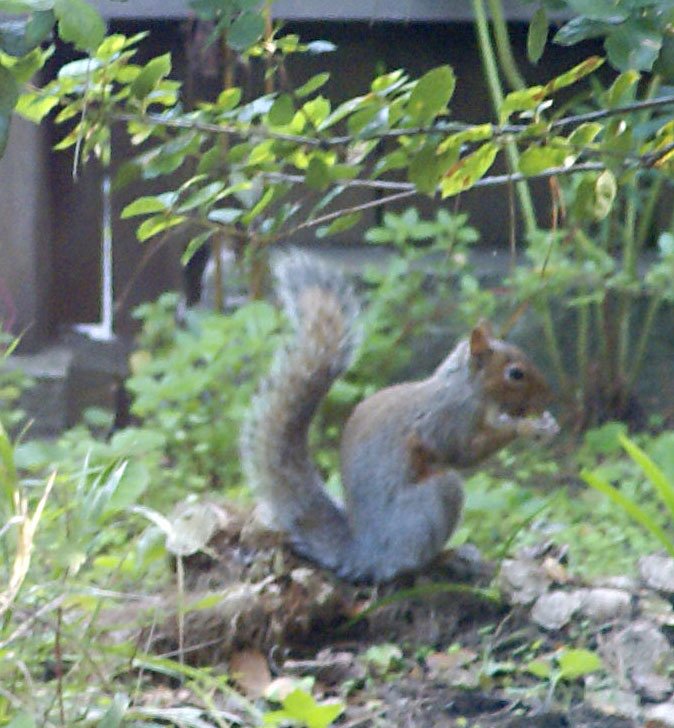 Now there are over 60 native species of which many are endemic to San Francisco or California. 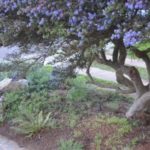 Native Plants adapted to an existing formal garden plan. 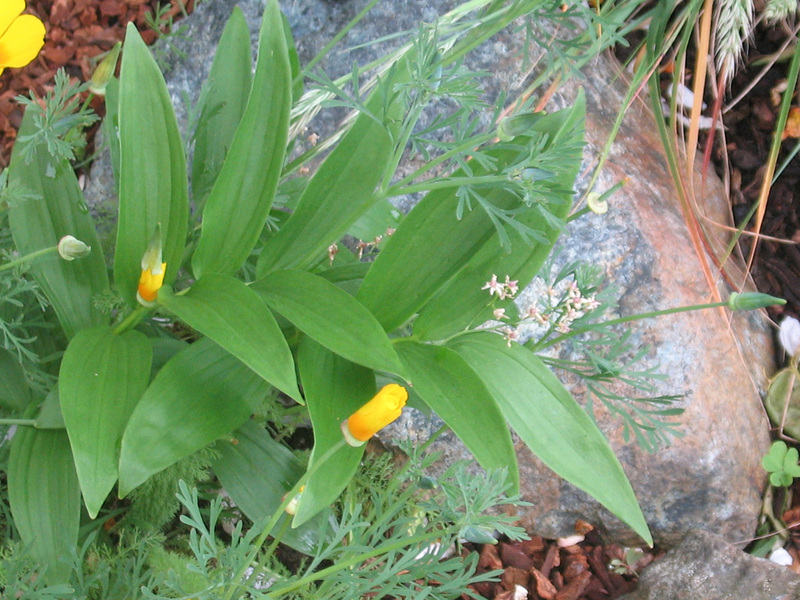 Most Non-natives were removed the in the process. 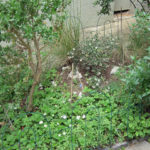 The previous garden had many invasive self propagating species, Calla lilly, baby tears, peacock lilly, english columbine, nasturtium to name a few. 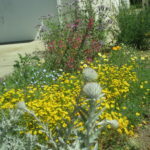 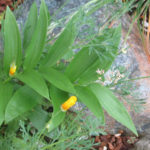 Perennial Natives are now established and many are self propagating. 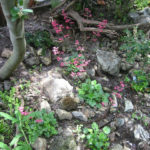 The garden has spots in deep shade to full sun the natives were chosen for the different types of sun and soil mostly clay. 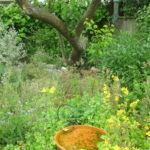 It also includes a vegetable bed and various herbs in pots. 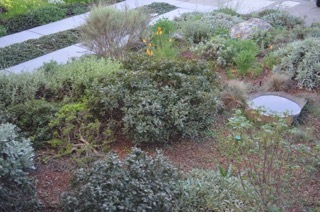 The center has a small solar fountain to add zen. 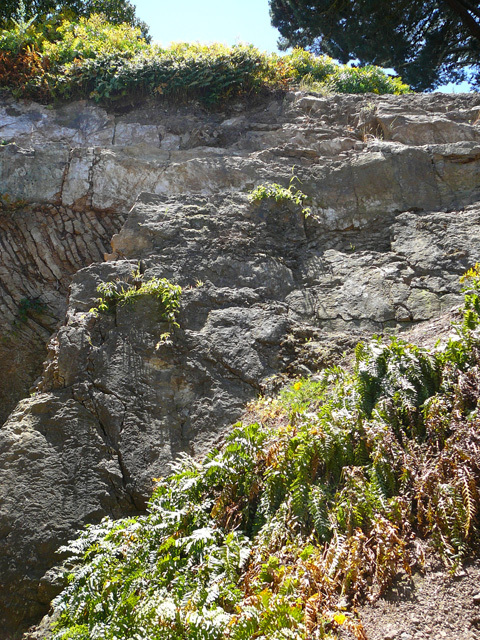 How To Enjoy My Memory Garden: 1) Walk out on the upstairs deck to view its scope and slant on O’Shaughnessy Cliffs, noting the big chert boundary rock. 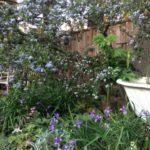 Look for remnants of our 3-year drought: upper slope, the skeleton arbutus tree and black branches of many once-abundant coyote bushes, but also, lower down, the amazing growth of five of our six oaks. 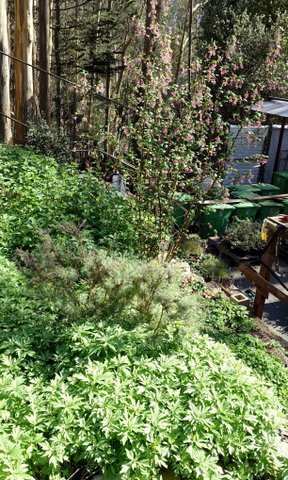 2) Standing on the downstairs deck, notice small red flags near the patio that mark 5 of 18 plants native to this hillside: bee plant, dichondra, dudleya, purple needle grass, soap plant. 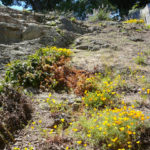 3) Walk down the flight of 16 wooden steps, follow the main trail between the two flowery meadows (left) and a shade oak (right); pass the large birthday oak at the foot of the central stairway, with its bright red mimulus, then the rock garden and hillside to the manzanita at the corner, above the marker commemorating our dear friend and master gardener Hilary Dunsterville Branch (1936-2006). 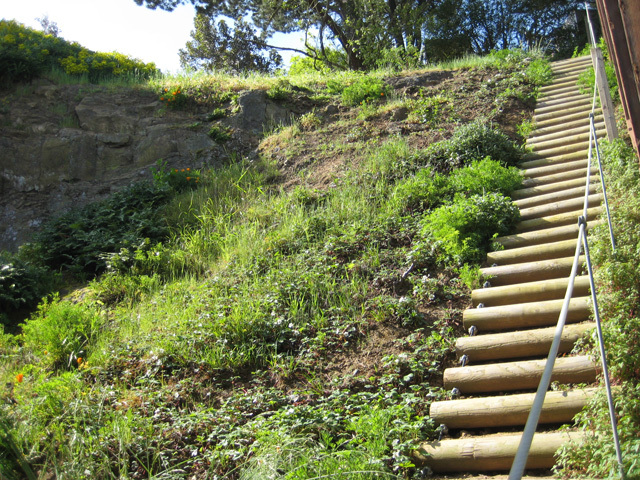 4) Turn up the zig-zag path to Marina’s buckwheat and succulent garden at the big rock. 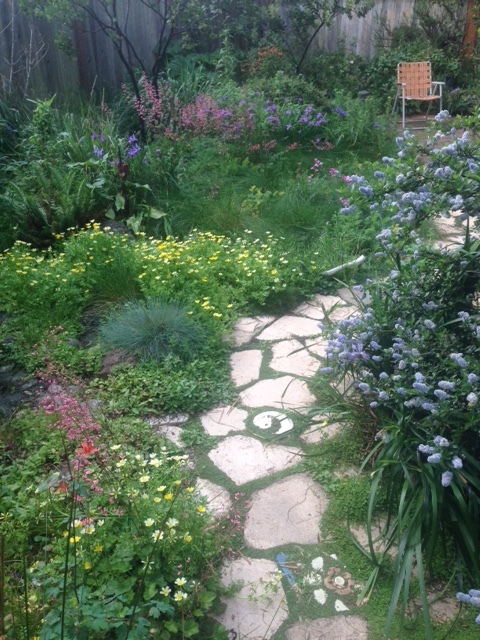 5) Meander toward the house past the red snapdragons, being sure to note the salmon mimulus and cedar marker commemorating Louis Prisco (1939-2015), who helped dig out and drag away the ice-plant- jade-and-broom thicket to start this garden seventeen years ago. 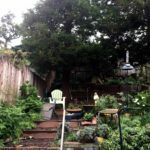 Very small but mighty garden. 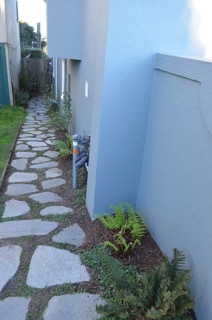 Easily accessible. 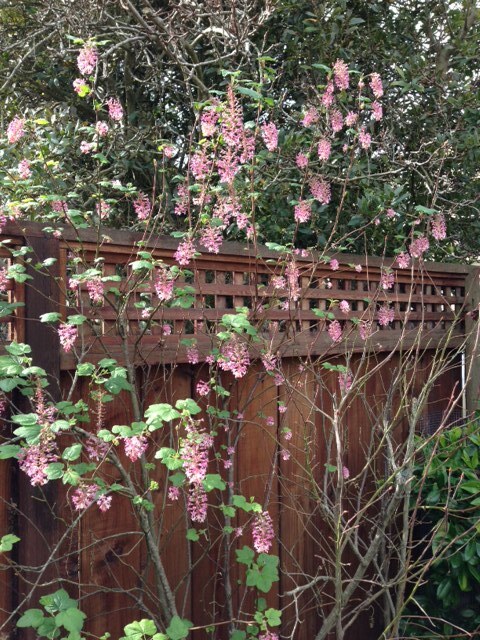 IncludesManzanita, holly leaf cherry, coffeberry, lemondberry, pink flowering currant, ceanothus. 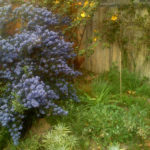 There is also a "guerrila garden" on the corner where many natives have been planted, such as silk tassel bush, toyon, ceanothus, grasses, and many more. 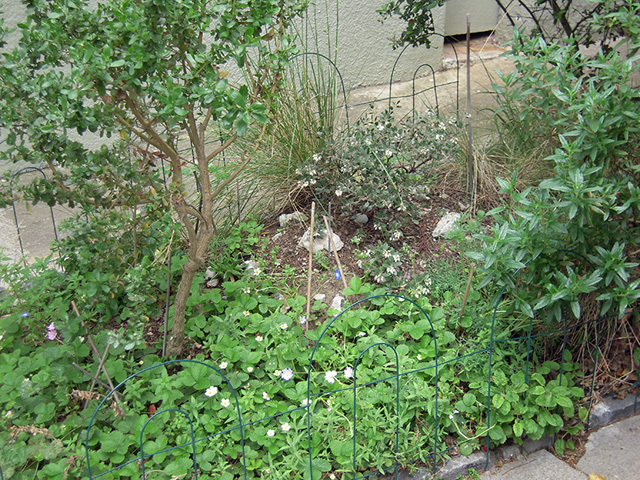 You can enjoy this as you walk to another garden on Valletta. 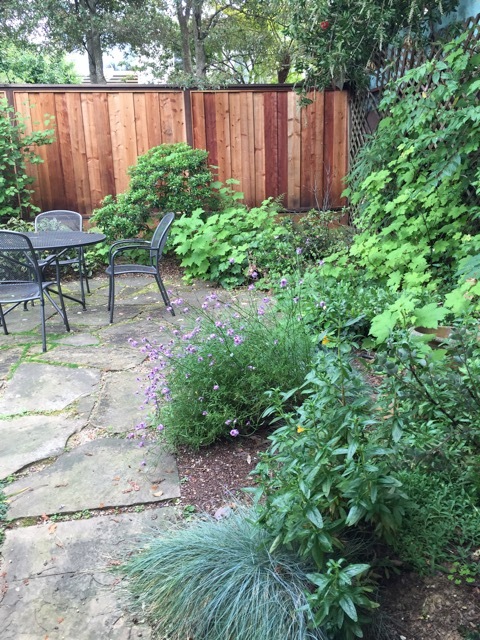 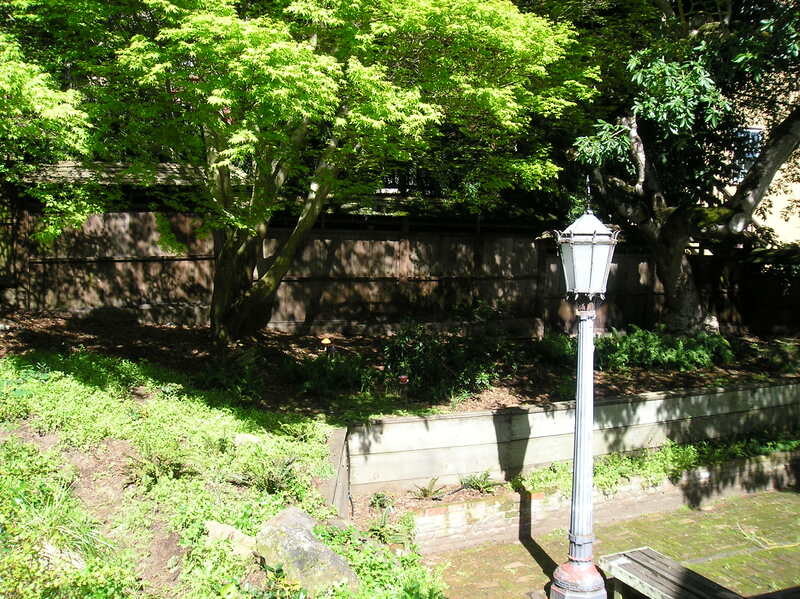 This very large garden includes an adjacent public walkway (Globe Alley) that is also landscaped with native plants. 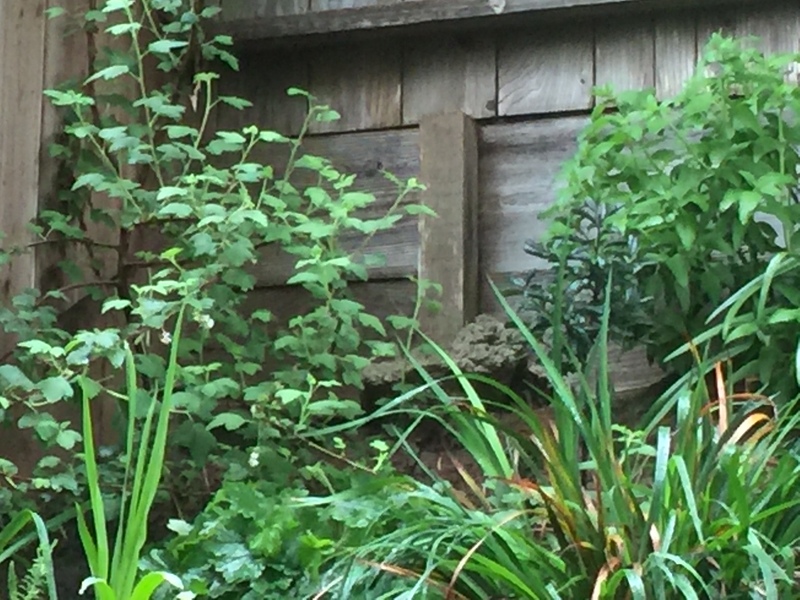 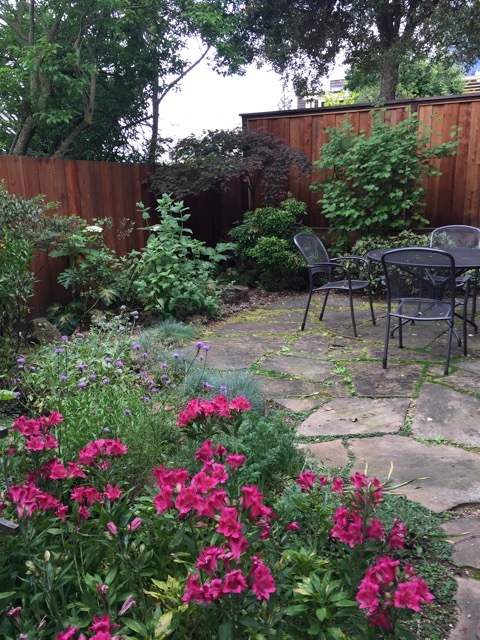 Greg Gaar converted this garden from lawn to a very colorful and attractive garden of San Francisco natives in just under a year and has now grown into a feast for the eyes. 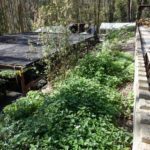 For more information on this ambitious undertaking, visit Greg at the HANC Recycling Center. 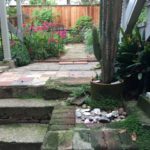 In addition to the 15-step public stairway into the back garden, there is a more accessible walkway to the left with gradual stepping stones. 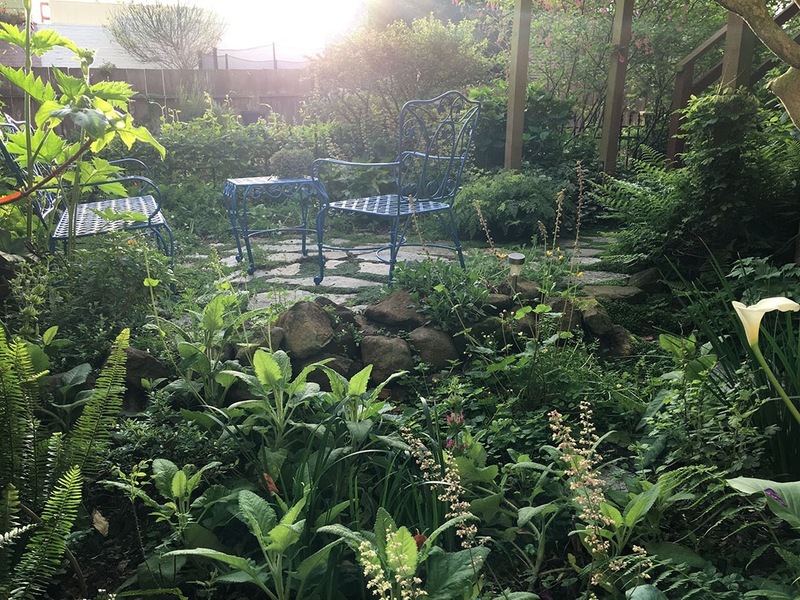 The native section of this garden is young, having been planted in the Fall of 2014 with the help of Amber Hasselbring of Art Ecology and Brett Stephens of SF Landscape. 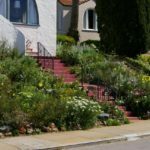 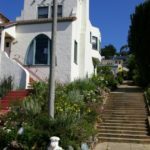 It is on the rear steep slope of the terraced garden that is accessed by walking through the garage, up some stairs, and onto a fairly steep terraced path. 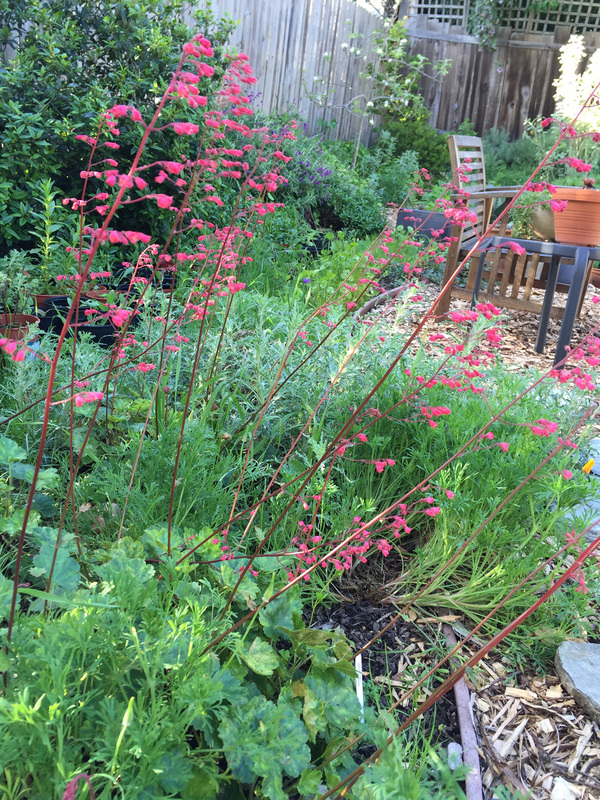 With two big redwoods as sentinels, the garden is evolving into a sanctuary for wildlife, birds, insects and me, with natives like ribes, saw grass, heuchera, tellima flourishing after our recent rains. 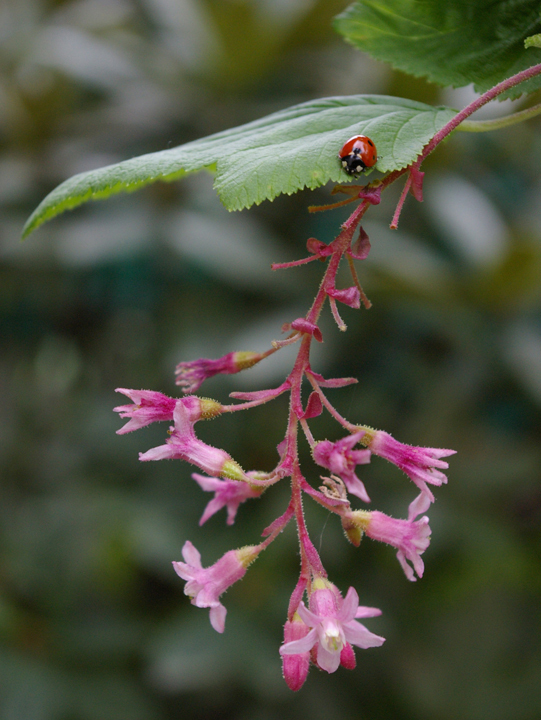 It has been a joy to see the natives thriving where there was once only choking ivy, weeds, and naked ladies. 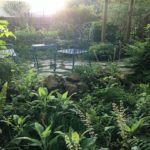 The lower part of the garden has some established non-natives like camellia or hyrdrangea, but I love escaping to the beauty and peace of the garden. 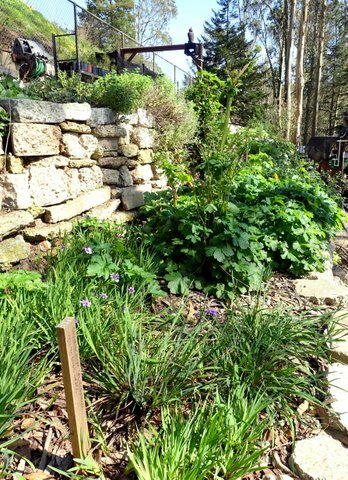 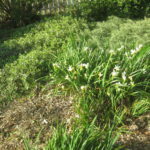 This garden includes a few volunteer natives, like blue-eyed grass, wild cucumber and polypody. 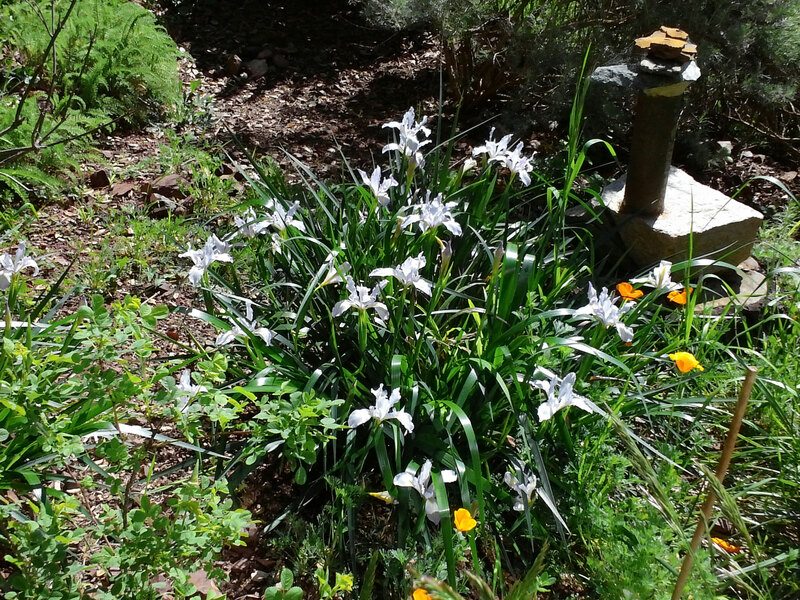 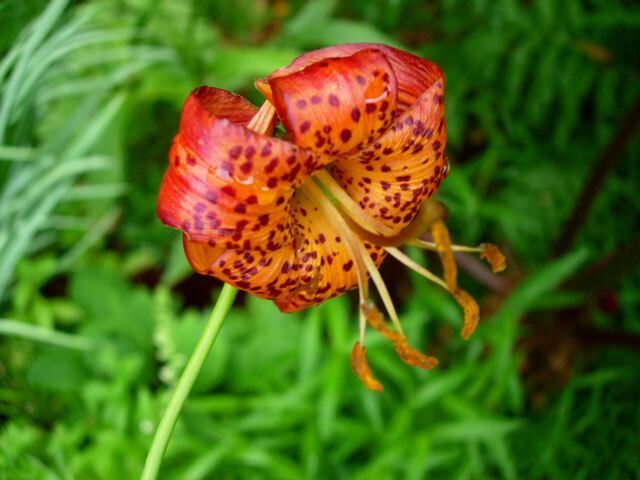 I have three rare & endangered species: Franciscan manzanita, Franciscan wallflower, and coast iris (longipetala). 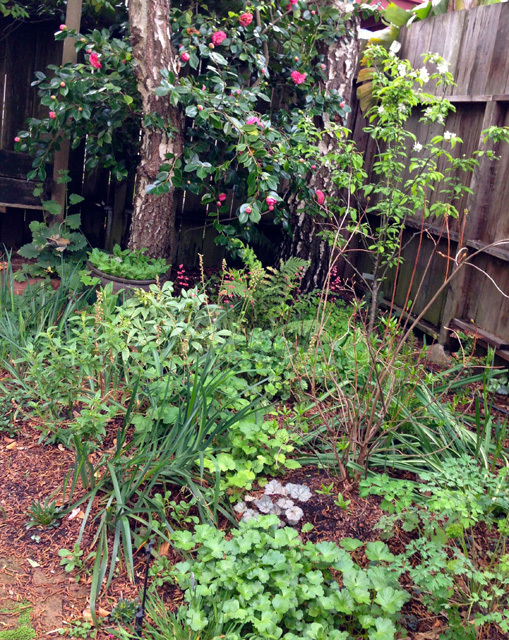 Also, my garden is 95% local native plants. 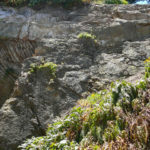 On one side of the garden there is a steep face of chert, replete with folded layers. 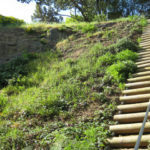 Access is steep, part rocky and at your own risk. 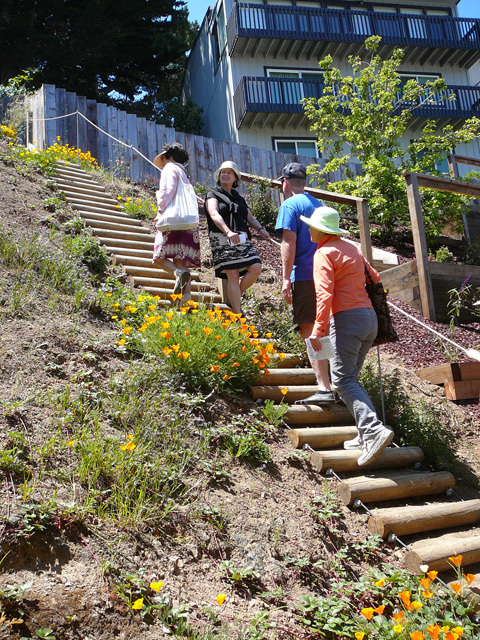 A cable handrail is installed alongside a suspended staircase; otherwise there is no rail. 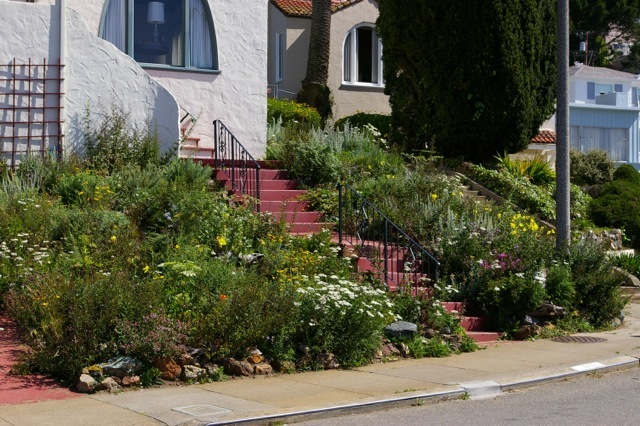 This garden exemplifies what can be done on difficult terrain. 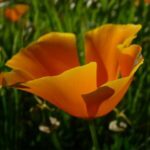 Close to 200 CA Natives out of maybe 2,000 varieties. 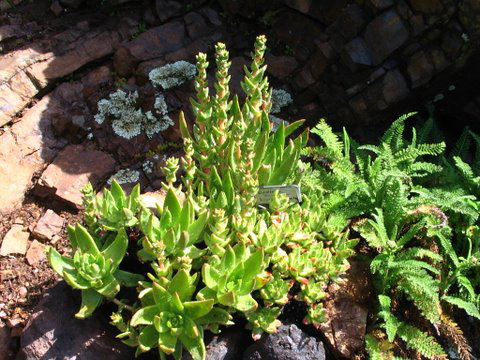 The theme of this garden is a rocky outcrop in a cloud forest. 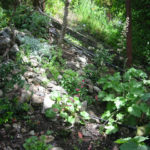 There are over a dozen soil types with waterfall and ponds, bog areas, scree, woodland, near cliff/berms - much variation. 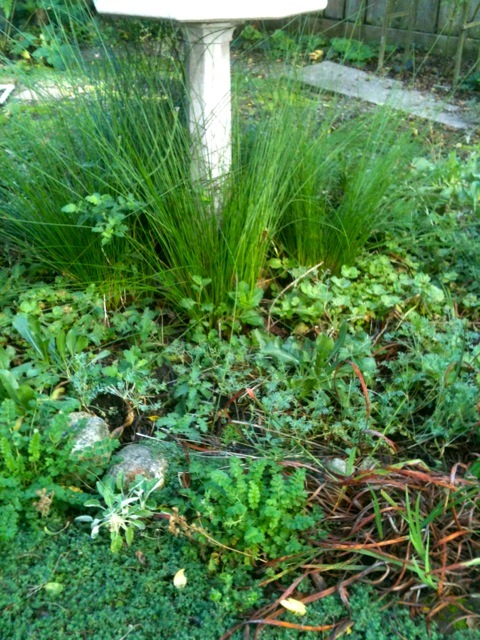 This recently (2012) planted 100% native garden was formerly a water-and-fertilizer-hungry lawn. 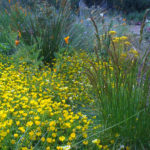 It's now on the way to becoming a prime example of the new "traditional landscape" for our semi-arid climate. 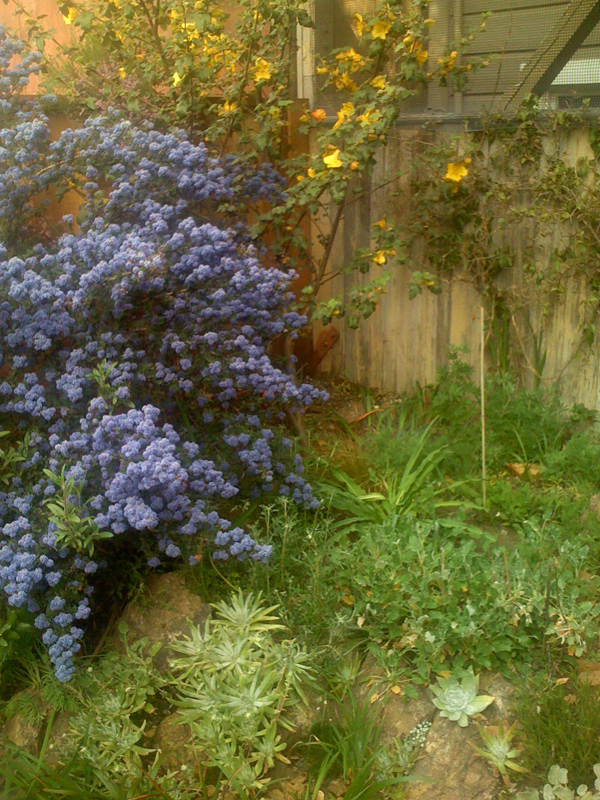 Mature Ceanothus and a new Silk Tassel Bush anchor the garden. 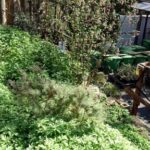 A large cast of perennials from the Salvia, Eriogonum, Iris, Rhamnus, Achillea, Artemisia, Festuca, and more genuses are filling in the remaining open spaces enthusiastically. 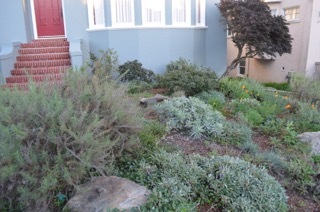 The front yard was planted by our family about six years ago and is an ongoing laboratory of sorts. 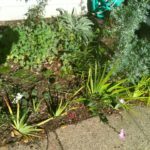 We’ve made some mistakes, but we’ve also had some pleasant surprises! 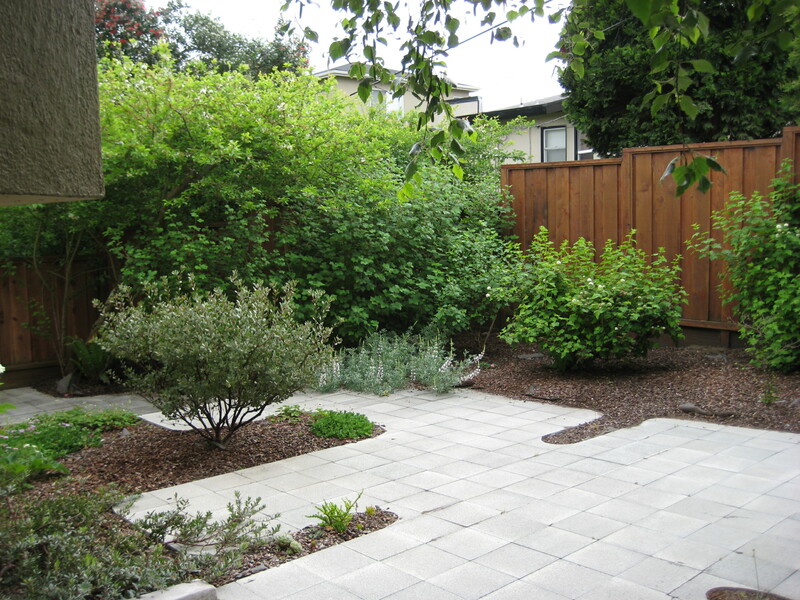 The back yard was designed by a local physician whose second career is native landscape design. 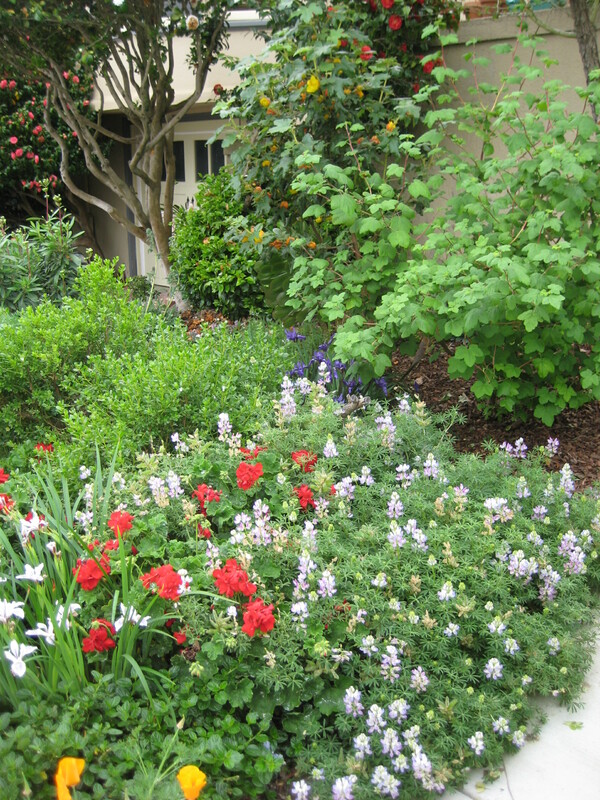 Both yards combine native plants, succulents and geraniums. 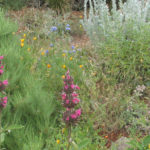 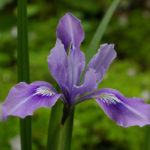 Native plants include: franciscan manzanita, wild ginger, pink flowered currant, phacelia, pacific coast iris, ceanothus, flannel bush, blue-eyed grass, silver lupine, penstemon, bush anemone, western swordfern, fringecup, wild strawberry, lizard’s tail, California horkelia and white sage. 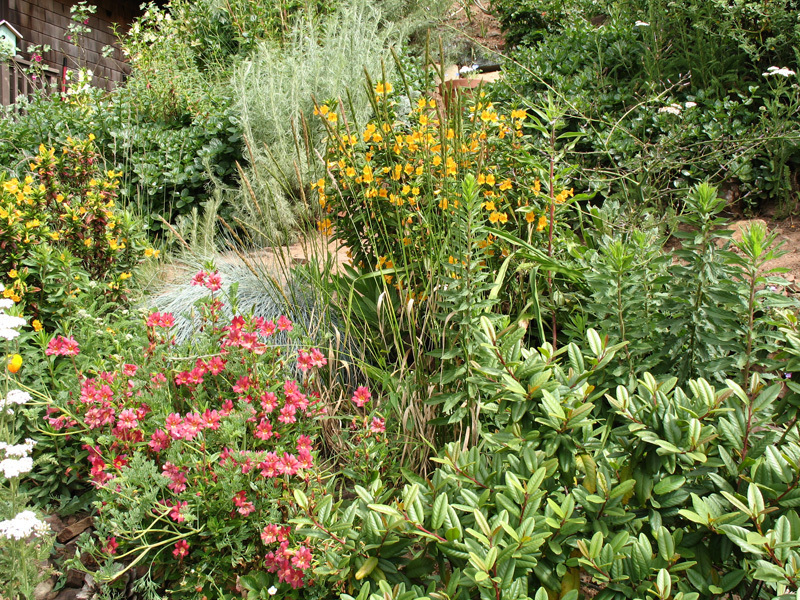 Under the expert care of gardener Marina Lazzara, our little patches of natives continue to change, grow and thrive! 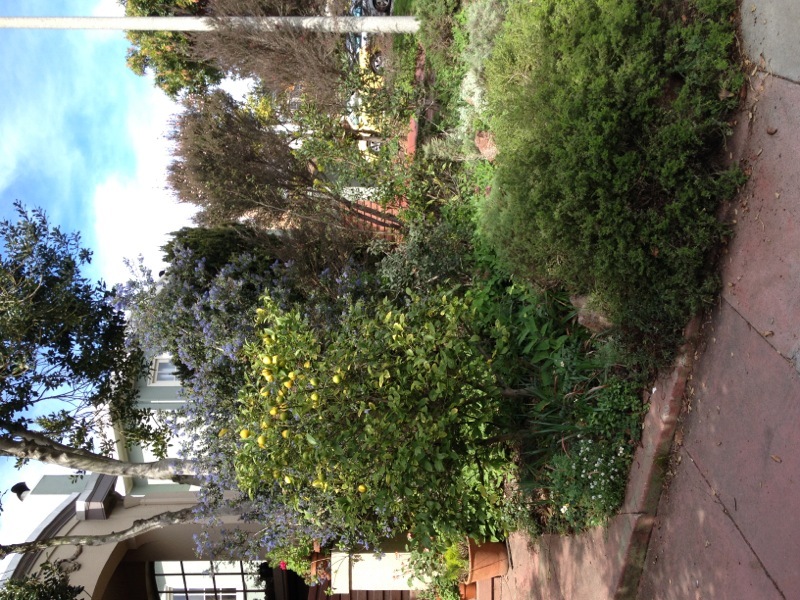 Shortly after this home was built in 1923 this front garden was planted with the still present yew, holly and camellia. 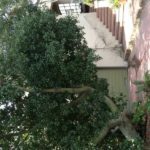 When we moved in the holly tree and shrubs were neglected, in need of pruning. 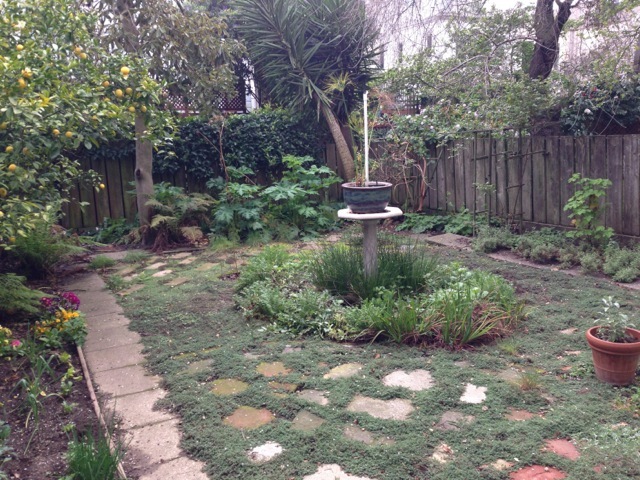 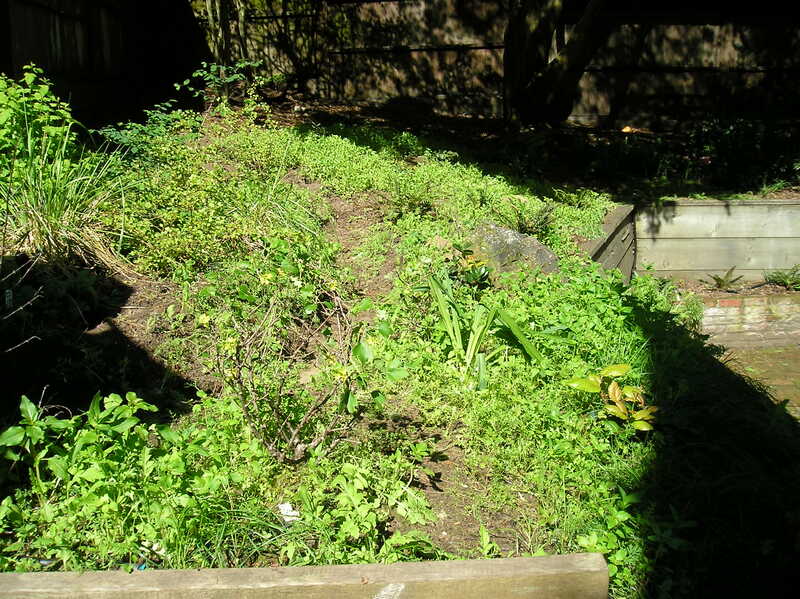 The yard was primarily lawn with a number of invasive weeds. 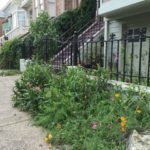 We decided to leave the historic plantings as they both offer habitat for birds and illustrate the historic character of the neighborhood. 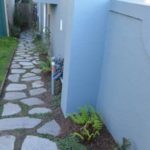 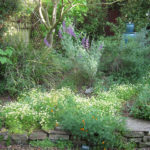 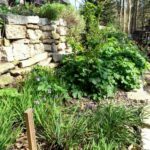 In 2003 we pruned the historic plants, removed the lawn, enlarged the planting area by removing concrete then applied permaculture principles, using cardboard and a thick layer of chips to discourage weeds. 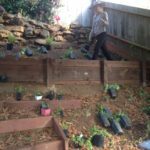 We planted a lemon tree and local habitat friendly natives including coast buckwheat, seaside daisy, strawberry, dune knot weed, hummingbird sage, soft blue rush, sword fern, mock heather, coyote bush, pink flowering current, thimbleberry, silk tassel, CA wild lilac and coast live oak. 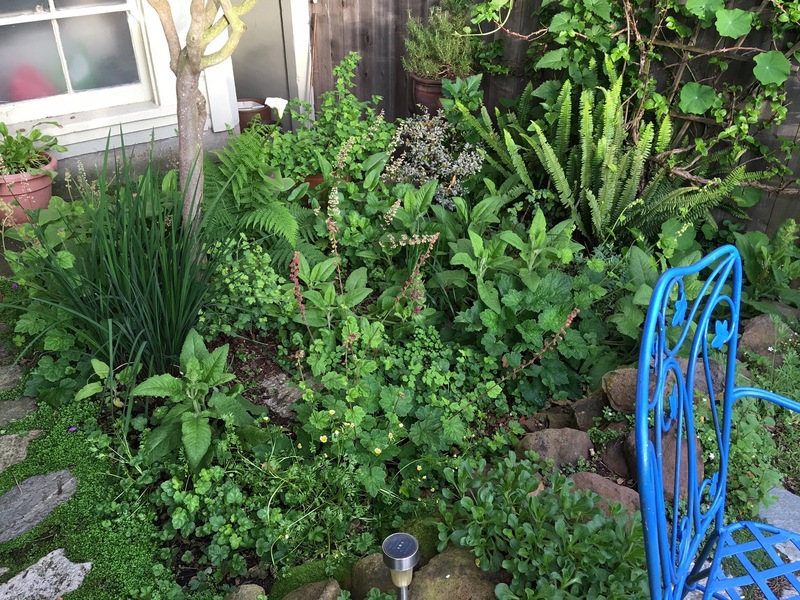 This 12 year old garden is constantly in change; gopher consumption, completion by more aggressive species and selective removal continue to alter the original diversity of the garden. 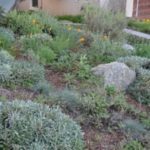 Formerly a lawn, this small natural area is nearing maturity, featuring an assortment of large shrubs including several buckthorns, two species of currant, a hollyleaf cherry, toyon, oceanspray, manzanita, and wax myrtle. 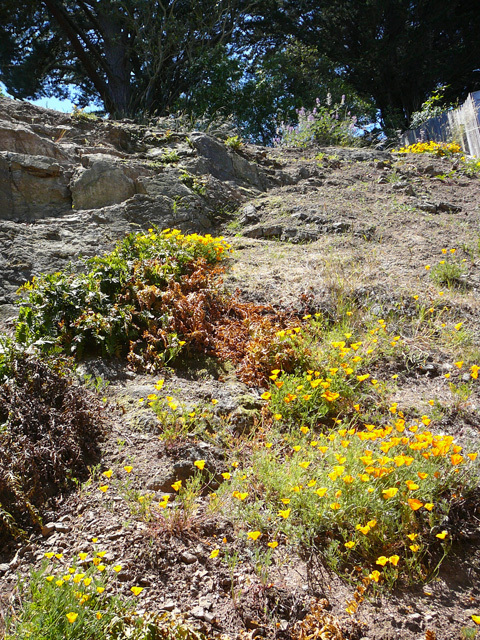 Finding micro-niches under the canopy are native roses, twinberry, ferns, honeysuckle, sage, iris, strawberries, as well as a few grasses and reeds. 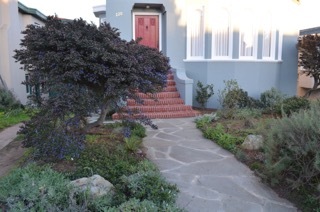 Small front yard with San Francisco origin native coastal prairie species, Purple Needlegrass, June Grass, Bicolor Coastal Poppies, Yarrow, Clarkia Rubicunda, Star Flower, SoapRoot with shrubs such as Lizard Tail and Coyote Mint. 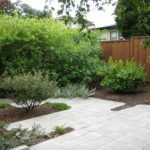 The yard came with a large Modesto Ash, a curving Box hedge, and heavy clay. 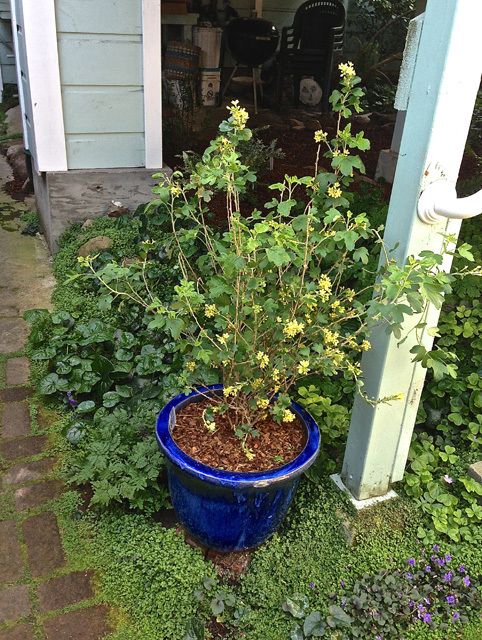 I went through an antique rose phase which is evident in the several bush and climbing roses. 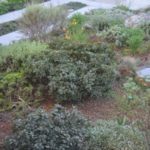 The native plant community is Coastal Sage Scrub but most of the plants are cultivars; I needed things that wouldn’t get too tall. 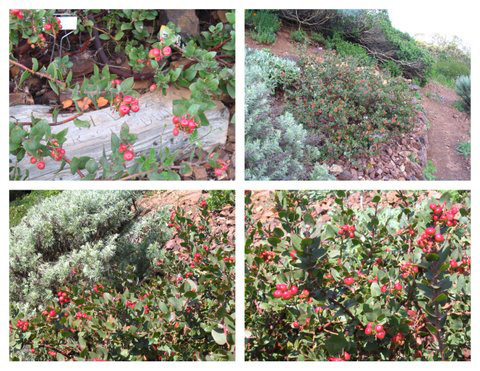 These include two different manzanitas, two different ceanothuses and an artemisia. 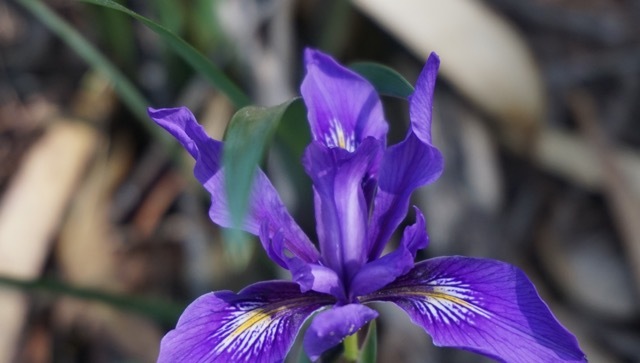 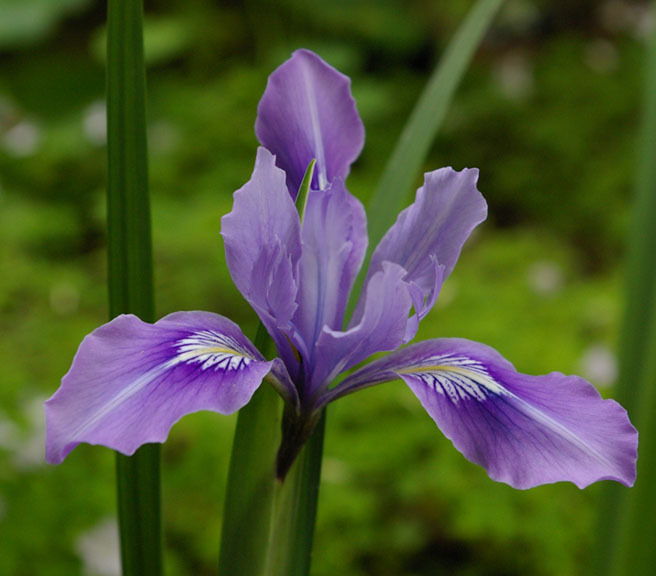 Non cultivars include, Douglas Iris, California fescue, and Creeping Snowberry. 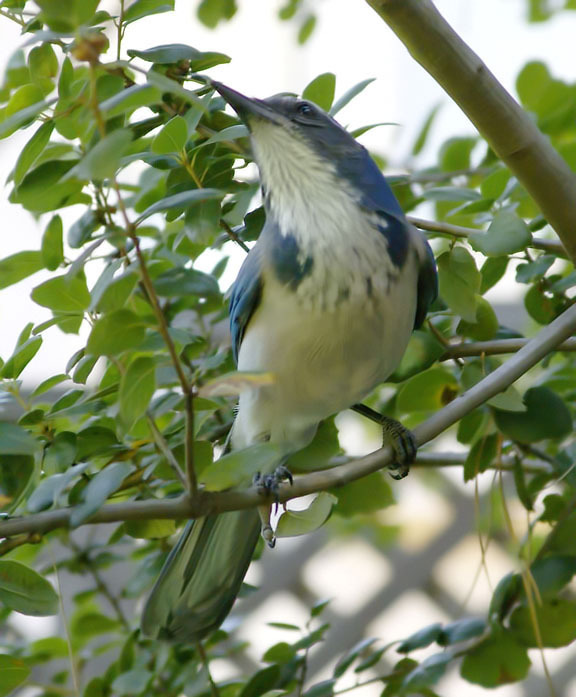 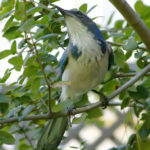 A Coast Live Oak and a Coyote brush were added by the scrub jays. 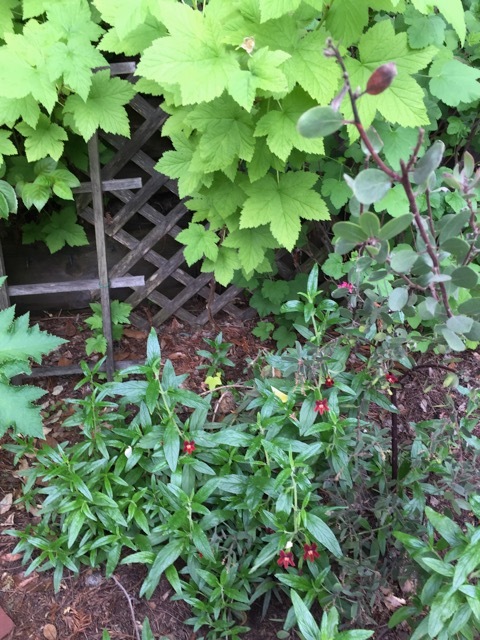 Near the house where I water to maintain the foundation, I have Huckleberry, Fringe cups, Brown twig dogwood (difficult to control, as it spreads), a blue elderberry, assorted small forbs. 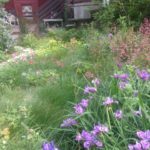 Across the driveway is an annual wildflower patch, that reseeded from last year with some judicious weeding to make it more balanced. 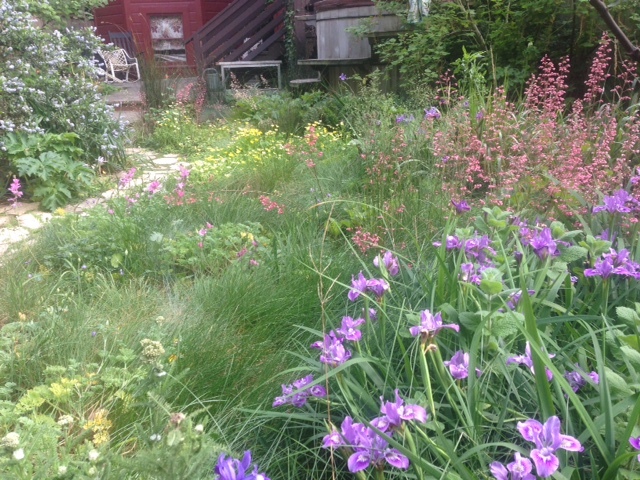 Warning: this is an area only a pollinator could love. 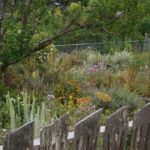 It is roughly Coastal Prairie with several kinds of grasses, grassland perennials like Checkerbloom, Coastal buckwheat, Sticky monkey flower, Mules ears, and annuals that the pollinators like and reseed. 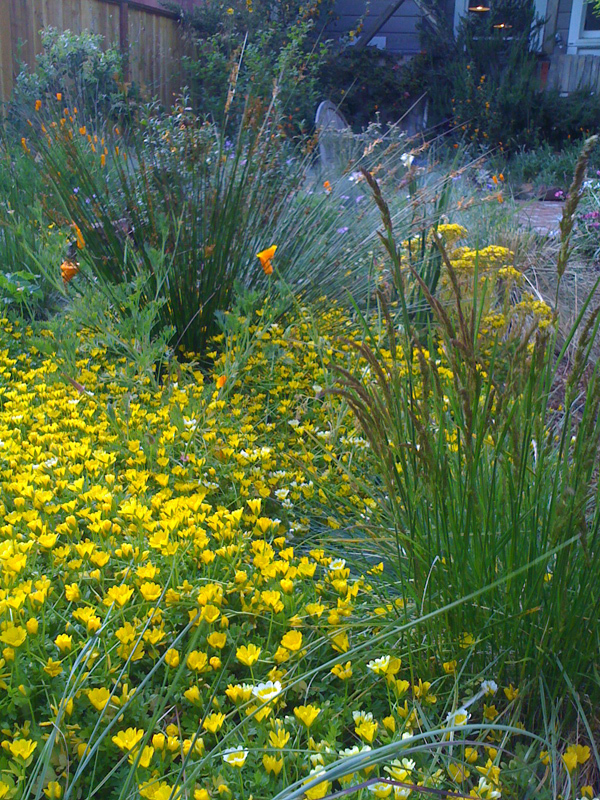 I have two bird baths on timers that drip over the sides of the bath to create a riparian area; this area is Chilean Aster, Goldenrod, Mule fat (beloved by hundreds of small pollinators, hard to control), Sneezeweed, Horkelia, Seep Monkeyflower, Euthamia occidentalis; viola, cow clover, coast iris, iris leaved sedge, various other forbs. 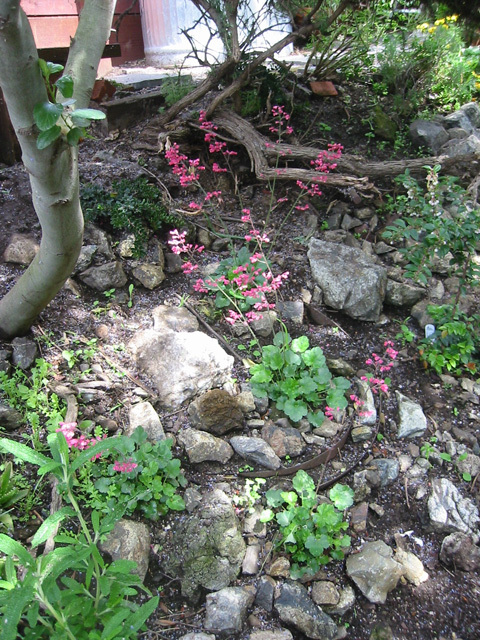 The edges are Ribes sanguineum, (several planted by the birds) a Wax Myrtle, a large Coffee berry, Ocean Spray, a huge grape, some fruit trees, roses and a few vegetables and culinary herbs.